Here are some of our favourite pictures from last weekends Vibrant Vegan Cornwall getaway, just beside Lands End. Stunning Cape Cornwall! The sun shone all weekend. The gardens of Boswedden overlook the coastline and the little old tin mines which trail along the cliffs. They even have a labyrinth in the garden which we enjoyed. It was the perfect location for our Saturday night fire, where we told stories, sang songs and read poetry. We even burned a chest of drawers (old and dilapidated;) which added a real spark to the evening! Malene’s yoga was based around the teachings of Patanjali, taking us right back to the roots and heart of yoga. All took part and felt the benefits. Yoga is for all! No matter what level we’re at. On Sunday night Malene and Will led a transformatory experience in the yoga hall. Yoga in the mornings is always a highlight, especially when the pool is open beforehand. The best way to start any day! Delphiris took over the lounge for the weekend for a variety of massage sessions, along with Jane’s reiki and menstrual cycle workshop, Malene was offering one-to-one yoga consultations and lifestyle coaching. All these therapies had such a positive effect on the weekend. It’s rare in life we can just let go, focus solely on taking care of ourselves and re-energising and aligning ourselves with healthy ways of being. This is what the Vibrant Vegan weekends are all about, it goes way beyond just what we eat, but a wholesome, balanced plant-based diet is a excellent cornerstone for a healthier body and lifestyle. We’re chuffed that there are at least two new vegans in the world after the weekend! We all talked a lot about new ideas, impetus and strategies to lead a more balanced life back in the ‘real world’, a life that is based around our own well-being and peace of mind, making us better equipped to deal with the ups and downs in life, allowing us to give life our very best shot! 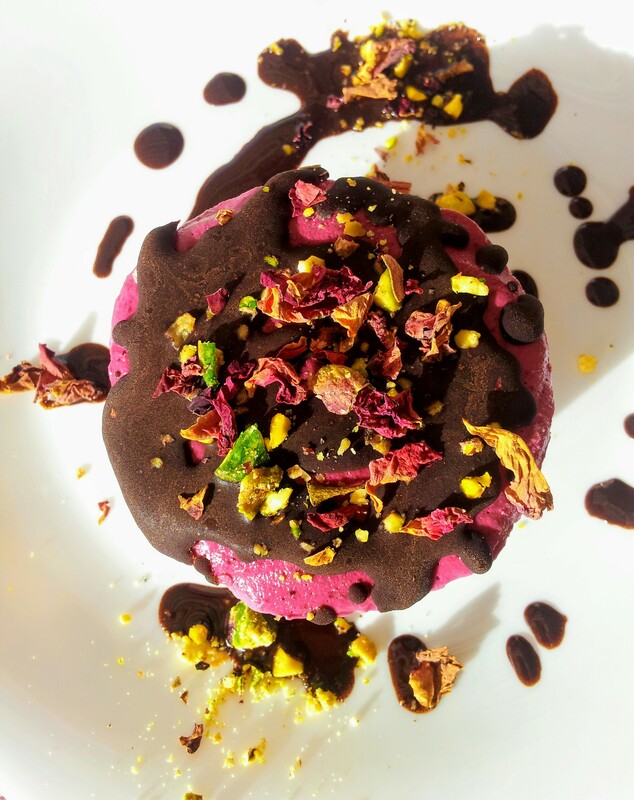 Our Vibrant Vegan holidays showcase what a healthy plant-based diet is all about, variety, colours, textures, fresh flavours, decadent treats, amazing nutritional bits and pieces. It’s a no lose, no sacrifice, all good way of nourishing our body. It doesn’t have to be challenging either, so many quick recipes when time is the master! The weekends are all about inspiring us to cook fresh food, during the cooking demonstration we talked about simple techniques to change the way we cook at home, saving time and approaching new ingredients with confidence. We even had a chat about vegan nutrition and how to thrive on pure plants. Big thanks to all who made our Vibrant Vegan weekend so special!! 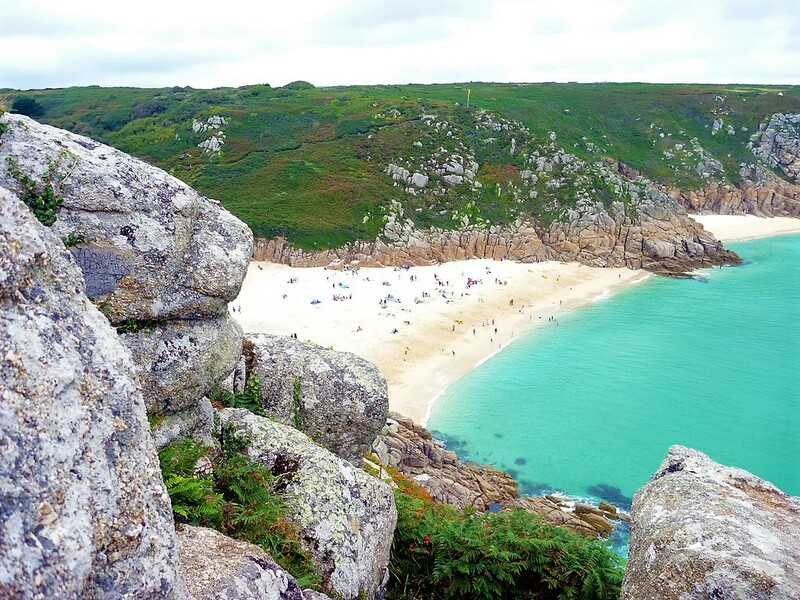 I know that a lot of people made it down to the beach and the surrounding coves, the ocean down in Cornwall seems really grand. There is the feeling that you’re right at the end of the island, looking out into the big, big blue. Refreshing! Our big thanks and love to all attended and made Vibrant Vegan a very special weekend for us all, especially Jane, Thelma, Nigel, Sue, Will, Malene, Will, Jenna and Cat (the cat) plus everyone else behind the scenes who helps to make these holidays and getaways such a peaceful and enriching time. It was our first time hosting an event in Cornwall and, as you can probably tell, we loved it! Let us know if you’d be interested in a Vibrant Vegan Cornwall ’19. PS – Extra thanks and hugs to Will and Sophia for taking these lovely pics. Our next BHK events are coming soon, lots of workshops, demos and holidays planned for ’18-’19. If you’ve attended on our our events, please leave us a review here. It’s a huge help for us in getting our message out there and rockin’ new recipes and all things healthy and happy food. Full details and new recipes all over on our private vegan cooking group. Join here. 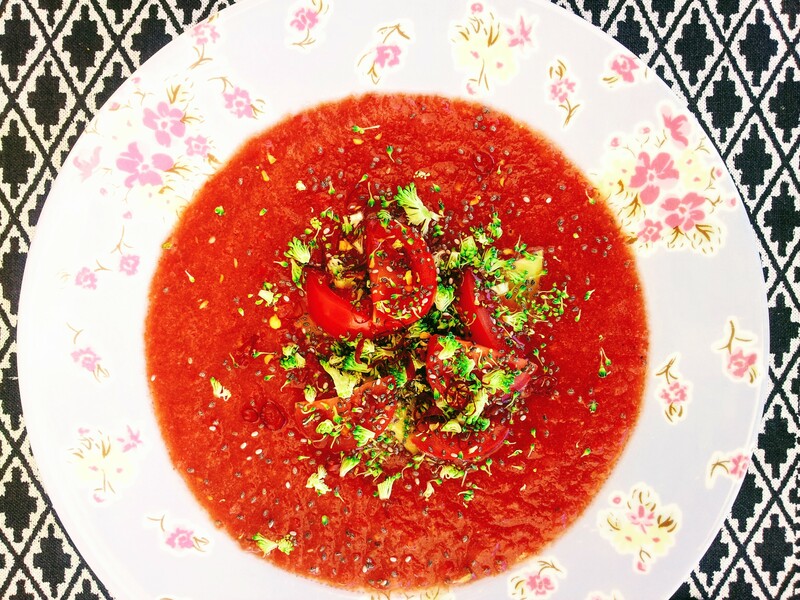 Discover creative cooking skills and have fun in Hackney this October with Lee Watson (author ‘Peace and Parsnips’ and beachhousekitchen.com). Saturday is all about Asian Street Food and on Sunday, we explore the diverse and hearty cuisine of Spain, perfect dishes for the upcoming wintertime. These workshops are hands-on, we’ll be making vibrant, globally inspired vegan dishes like a show stopping Wild Mushroom Paella, light and fluffy Baked Pea and Mint Tortilla, creamy and spicy Malaysian Squash and Coconut Laksa, classic Teriyaki Tofu Onigirazu – Japanese Sushi Sandwiches with Cauliflower Rice, fragrant Pad Thai Salad and lots, lots more. Desserts will include a Spanish Chocolate Custard Pie (sugar and gluten-free), plus Sticky Thai Coconut and Mango Rice. You’ll no doubt learn many new tips and techniques to make healthy, inspiring, home cooked meals an everyday reality and tune into, or unearth, your inner chef! We’ll be focusing on nourishing food with big flavours with plenty of treats; from meals in minutes to decadent desserts, one pan wonders to dishes slightly more complex, aka weekend specials and the best part is, we’ll all sit down together at the end to enjoy our tasty creations. Each day starts with fresh teas and coffee, and you are given your bespoke recipe book for the day. We talk through the recipes and a little about the nutritional aspects of the days menu and then, we cook! Working together in small teams at well equipped stations. Numbers are kept low, so Lee and his team can offer constant assistance. The Cook Vegan! recipes are designed to be accessible and interesting to every level of cook and the days are themed, taking in two of Lee’s favourite places in the world, Asia and Spain, places Lee has travelled, and eaten, extensively. This is food that is packed with bold flavours and bright colours, that also happen to do us good. This is the weekend for plant-based inspiration! You’ll leave with a host of exciting recipes and bags of knowledge about plant-based food in general, with resources and support offered for anyone thinking about cooking and living a vegan lifestyle or those simply looking at incorporating more plant-based dishes into their kitchen repertoire. This is Lee’s second visit to Made In Hackney, one of his favourite venues in the UK, and judging by last time, the weekend will sell out quickly. Book soon! Asian cuisine, focusing mainly on South East Asia, is so vibrant, fresh and tantalising. It is a place very close to Lee’s heart, where every street seems to be a moveable feast. This street food represents one of the world’s greatest food experiences, eating delicious dishes whilst getting lost in a maze of food vendours and flavours. Having lived in the Philippines as a child, Lee was raised on spicy, fragrant food and he can’t wait to share with you a range of recipes that summarises, in many ways, the food of such a diverse area. One thing is constant though, the food is always amazing! 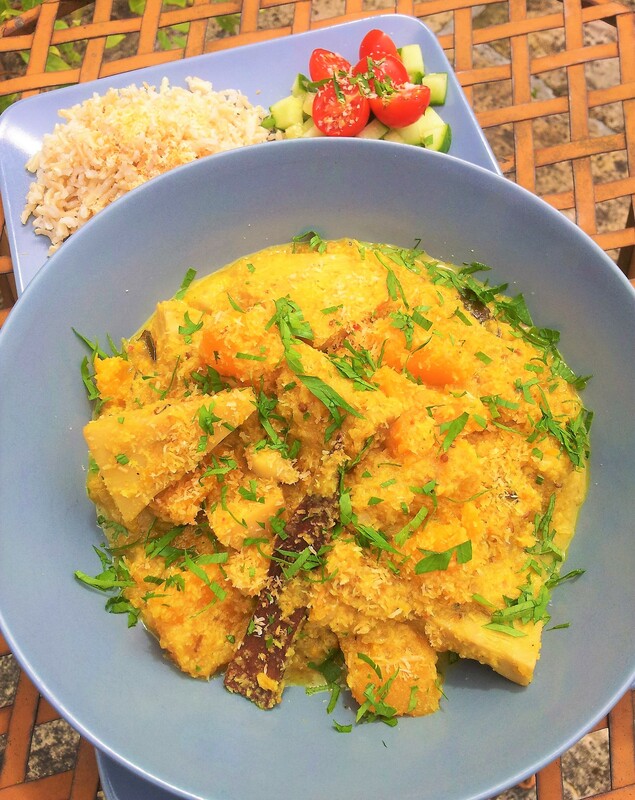 We’ll be making a creamy and spicy Malaysian Squash & Coconut Laksa, Teriyaki Tofu Onigirazu – Japanese Sushi Sandwiches with Cauliflower Rice, fragrant Pad Thai Salad with Kickin’ Peanut Sauce and Sticky Thai Mango & Coconut Rice. There will be surprise dishes on the day too! All dishes are gluten and sugar free. 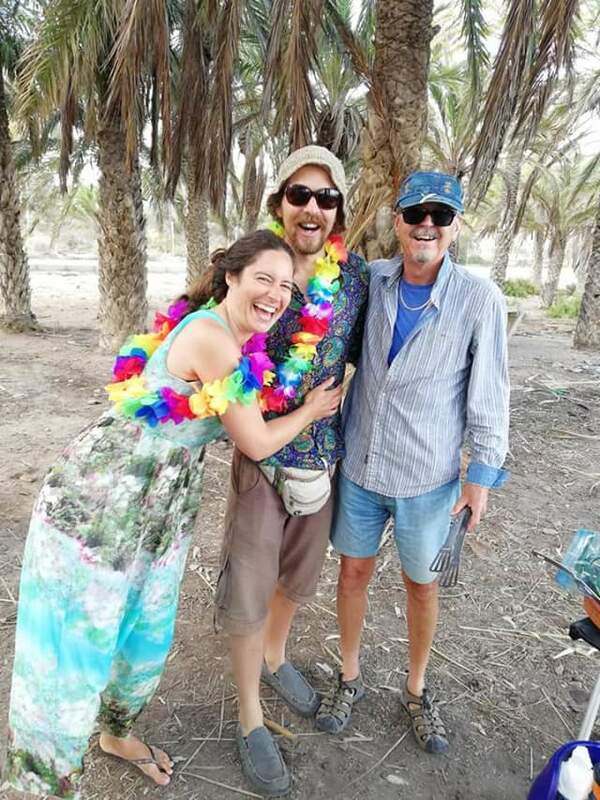 Lee is in love with Spain, his family have a home on the coast in Murcia. He has just spent the summer there cooking and travelling this diverse country. These original recipes have been developed recently, using the very best seasonal produce, most are classic dishes veganized, with all the fresh and satisfying Mediterranean flavours. We’ll be cooking a show stopping Wild Mushroom Paella, light and fluffy Pea & Mint Tortillas with Garlic Mayonnaise, rich and more-ish Andalusian Chickpeas, a Mandarin, Red Onion & Black Olive Salad and Almond Horchata. Dessert will be a twist on a classic Spanish Custard Tart, we’ll make Mini Chocolate Custard Pies (all recipes are gluten and sugar free, but satisfying decadent!). Lee will share his passion for Spanish cooking, it’s variety, colours and big, bold flavours. With winter just round the corner, we’ll be making some satisfying classics, to ensure you have the healthy comfort food recipes you need to see you through winter. Food that is rich and gorgeous but also nourishing and packed with nutrients. A happy balance! Any idea that Spanish food is not vegan-friendly will be quickly forgotten. bespoke recipe booklet, vegan nutrition know-how sheet. I think we all need one of these fruity, icy drinks at the minute. Seems like this heatwave is enjoying itself! How are you staying chilled? It was 32oC in North Wales yesterday, which is just outrageous. 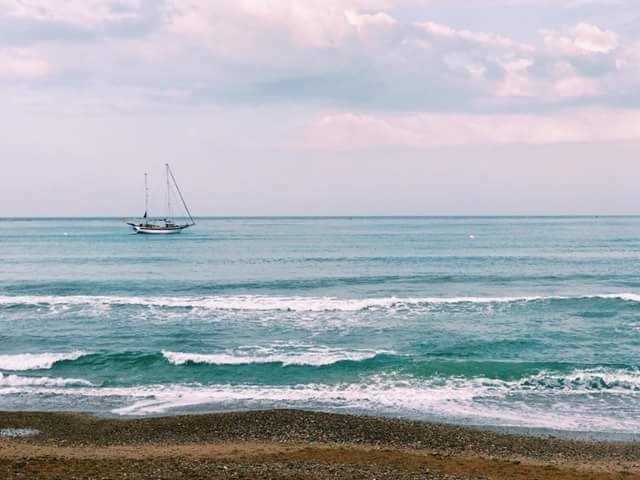 Seems like we’ll miss all the sun, but we can’t complain in the slightest, the Spanish coast has been very good to us. Granizado is something I enjoy in Spain and also Latin American, a traditional cooler, the varieties change constantly, but the constant is that it’s super refreshing when the heat is on. I wanted to share this now as it’s super quick and easy to make and only takes a few ingredients. I have heard of people making these into cocktails! This is really a slush puppy gone to heaven and you can swap and play with which frozen fruit you use. Berries for example are also incredible, as is pineapple, cucumber or mango. Just make sure you add a nice twist of citrus to keep things lively and if you have a sweet tooth, pop a little sweetener into the mix. Most watermelons I buy have very few pips/ seeds. When chopping the melon, take out as many as possible. A few in the granizado are fine. The main thing is they just don’t look very nice. A nice idea is adding a little fresh mint to this granizado, around 8-10 mint leaves will make things interesting. Optional – 1-2 teas sweetener – sugar, agave, bronw rice syrup…. Peel and cut up your water melon into small chunks, place in the freezer for a few hours. The smaller the chunks, the easier it is to blend later. Place the watermelon into a blender, add the lemon and sweetener and blitz until broken down. If it is not blending well, just leave it for 10 minutes to defrost a little. Serve in your fanciest glasses, with a slice of watermelon on the rim, to keep things 80’s/ Miami Vice style. Watermelon is very hydrating, they’re around 92% water! Perfect for summer. They also have good levels of vitamin C and A. Sign up for our newsletter here, don’t miss a recipe, all our events, news and tall tales from the Beach House Kitchen. Discover new cooking skills at this hands on vegan cooking workshop led by Lee Watson (author ‘Peace and Parsnips’ and beachhousekitchen.com). Learn delicious and creative tips and techniques to make healthy, home cooked plant-based meals an everyday reality. 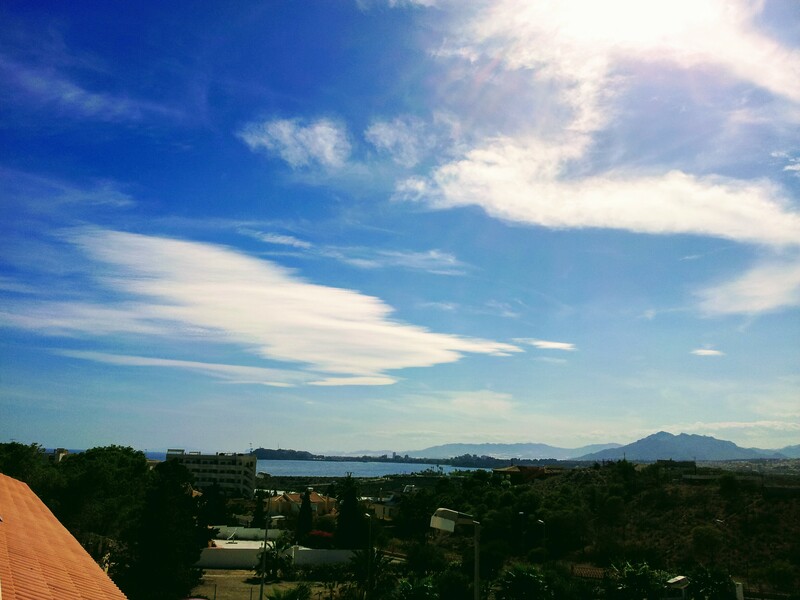 Lee is in love with Spain, his family have a home on the coast in Murcia. He has spent many years cooking and travelling there and this summer hosted a cooking retreat in a beachside villa. These vibrant Spanish recipes have been developed recently, most are classic dishes veganized, with all the fresh and satisfying Mediterranean flavours we adore. All dishes are gluten and sugar free, but still decadent! Lee and his team will also be preparing a Mandarin, Red Onion and Black Olive Salad, plus a Almond Horchata to sample on arrival. The best bit is, we’ll all sit down together at the end to enjoy our tasty creations. If the weather is nice, maybe we can even eat outside on the terrace, overlooking the river Mersey. Spain is changing, with more and more vegan options and restaurants appearing, but many dishes are still based on meat and fish. Lee would like to show you how to get big flavours and the right textures, using only plant-based ingredients. It is more than possible! Lee will share his passion for all things healthy, vegan and of course, Spain. He will demonstrate some techniques and dishes, but mainly you’ll be cooking in small teams, working together at well equipped kitchen stations with constant support from the Cook Vegan! team. We’ll be cooking dishes with big, bold flavours and colours. With winter just round the corner, these are satisfying classics, ensuring you have the healthy comfort food recipes you need to see you through a very tasty winter. Food that is rich and gorgeous but also nourishing and packed with nutrients. A happy balance! You’ll leave with a full recipe booklet and information on plant-based nutrition, so you can try out all the dishes at home for yourself. The recipes are flexible, so once you’ve learned the technique for say, a great paella or tortilla, you can use different ingredients, or whatever’s in the fridge. This is Lee’s second visit to the Food Sorcery kitchen, a brilliant, modern venue. Judging by last time, the weekend will sell out quickly. This is the dessert for chilling and enjoying on sunny days. Once we tasted it, we knew we’d be making these little cheesecakes all summer! It’s a dessert that looks like a million euros and tastes much better!! A tantaslising, layered cheesecake, rich, light and fruity all at the same time with a (quite) secret chocolate base and chocolate sauce that freezes and then cracks when cut into! Plus, it’s simple to make. They’re vegan, gluten and sugar-free. It’s an all-round keeper, we had to share it with you all. We’re still pretty blissed and floating around Spain, what stunning place! Everytime we visit we love it more. Finding new places to adore and a pace of life that tickles us. Manana! Hoooray!! We’re heading off next week to some national parks down near Granada, lots of camping and snorkelling. It’s birthday season here, it was mine (40 years and feelin’ gooood), Mum’s (age unprintable) and Jane’s (40 too in a few days!!) We celebrated our 80th (40+40) birthday with a few friends down at a perfect spot, under some palm trees facing the beach. There were top tunes and a full power vegan bbq, which Dad and I cooked. We sat under a full-ish moon and watched the sparkling waves until sun was about to poke it’s head up. What a day! Barbecue is something very special for me and if you’re coming to any of our holidays or events this year, there will no doubt be some bbq action. Cooking outside is such a treat, with all those smoky aromas. Love it!! Birthdays, of course, mean desserts. With a big ‘D’. Lots of them. Constantly. So, I’ve been making a load recently and have really enjoyed all that sweetness, I’ll post as many as possible. The fruit layer is flexible, you can try out other fruits. We’ve made it with just strawberries and the results were delicious. The great thing about these little cheesecakes is they just sit in the freezer until you desire them. Make a good amount and you’ll have cheesecakes on demand 24/7! What a thing!! You might be thinking that soaking nuts is to make them soft, which it is, easier to blend to a lovely smooth filling. But, there are also some real health benefits to soaking nuts, read more below in the ‘Foodie Fact’. Put these cheesecakes in front of your favourite people this summer and I promise you’ll get only full smiles and load yums. Cheesecake makes the world happy! Feel free to share this recipe far and wide, the more the merrier! For other recipes and BHK news and updates, why not like our Facebook page or our private Vegan Cooking group. You’re defintely invited! 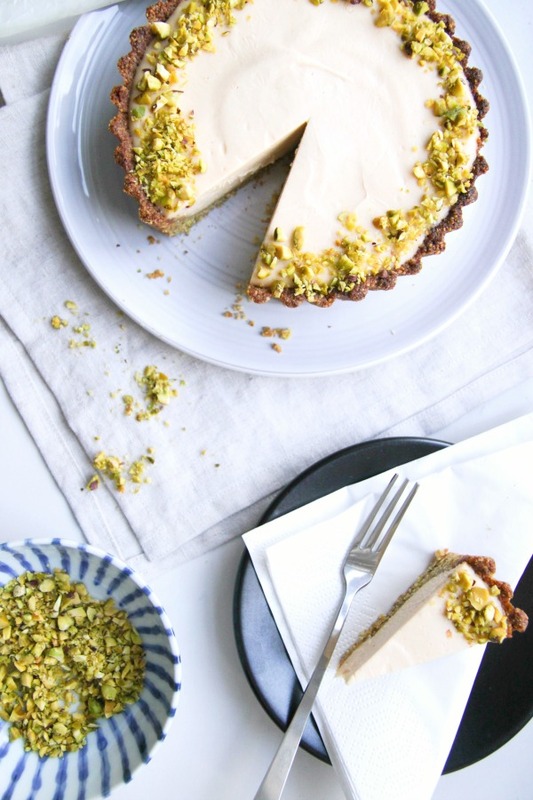 Happy cooking and please let us know if you make these cheesecakes below, hearing from you brings a load of sunshine to our days. If your dates are not soft to the touch, soak in warm water for 1 hour and drain well. If you’re in a hurry, pour hot water (from a just boiled kettle) over your cashews, this softens them quicker. If you have a powerful blender, you don’t need to soak them at all. I have tried these cheesecakes with other neutrally flavoured oils and it does work, but coconut oil is best, when the cheescake it cool, it helps to give a good and creamy texture. Use any frozen berries, but I prefer a mix. Things like strawberries, raspberries, redcurrants, blackcurrants, blackberries etc. Bags of frozen berries can be bought, normally well priced, in most supermarkets. This recipe will make 7 reasonably sized cheesecakes, or 6 big ones. See how you get on. You’ll need a standard, 12 cup muffin tray (or maybe you call them Yorkshire Pudding trays?). The deeper sort, ideally the non-stick, silicone type which is flexible. This gives a much better finish to the cheesecake as we don’t need to line the individual cups. Crust – place the walnuts into a food processor and pulse until a rough crumb forms. Add the other ingredients and pulse until a dough forms, which should stick together when pressed between finger and thumb. If you do not have a silicone, non-stick muffin tray, line 6-7 cups with cling film. Now, spoon roughly two heaped tablespoons of the base mix into each cup. Press the dough down with the back of the spoon or your fingers to make a neat layer that snugly meets the edges. Filling – blitz all the ingredients, except the berries, in the now magically clean food processor (bless those kitchen elves) until you have a smooth cream-like texture. You may need a few goes to get it all incorporated, scraping the sides down with a spatula. Keep going, get it really nice and smooth, it makes all the difference. Taste the mix, adding more sweetener or lemon juice if needed. I like mine with a good zing of lemon. You should be left with 500ml of filling. Scoop out half the filling mix and set aside, add the berries to the food processor and blend again until smooth. Pour or spoon an even quantity of the white filling onto the bases, followed by an even quantity of the berry filling. Tap the tray on kitchen surface a few times to get rid of any air bubbles and place carefully in the freezer, making sure the cheesecakes are level. It will take a few hours for them to freeze, you can, of course, make these cheesecakes well in advance. Just cover them with cling film, or pop each cheesecake out and gather the excess cling film around them. The last way is nice and easy. Sauce – Combine the ingredients in a bowl and stir together until well combined. Taste and adjust as you like it, more sweetener or a little more bitterness from the cacao/ cocoa. Depending on the ambient temperature, leave the cheesecakes on your dessert plates for 20 minutes out of the fridge. We left these for around 10 minutes, but we’re in Spain and its a wee bit hotter than Wales and maybe where you are. We quite like them when they’re still a bit frozen, especially on a hot day. You may also find placing the cheesecakes in a fridge and leaving them for a couple of hours to help control the defrosting. 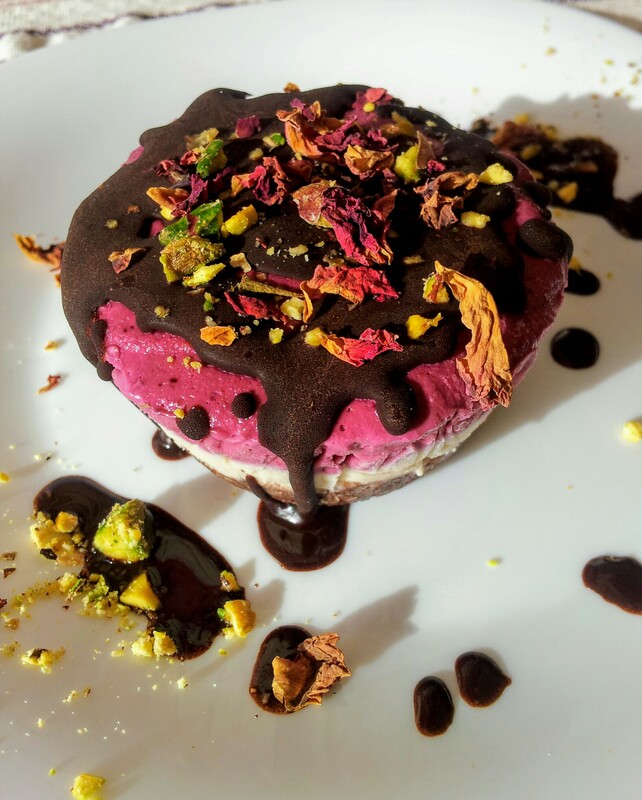 While the cheescakes are defrosting, drizzle over the chocolate sauce and, just before serving, top them with crushed pistachios and rose petals, also grated white chocolate or extra berries is equally as delicious. Soaking nuts? What’s that all about? Nuts are packed with nutrition and things that do us good, but they also contain things called phytates and enzyme inhibitors, which decrease the nutritional value of nuts, grains and seeds, plus they make them harder on the digestion. Soaking nuts activates helpful enzymes, mimicking nature really, the nut transforms, thinks it’s time to sprout. Many nutrients will also become more bio-available (easier to use by the body). Another way to aid digestions of nuts with skins, ie almonds, is to remove the skins. By soaking your nuts, it makes this job super easy. Also, soaking the nuts, and rinsing, gives them a good wash, which is never a bad thing. The best way to soak nuts is by covering them in fresh water, add a little salt (until it tastes as salty as sea water), then leave overnight or for 8 hours-ish (almonds more like 12, macadamisa 4). The salt is optional, but is said to improve results. Be sure to throw away the soaking water and rinse them well. You could then dry and roast gently in a low oven to make them extra delicious or dehydrate them, if you have a dehydrator handy. Find peace, get healthy, be happy this summer with the Beach House Kitchen! 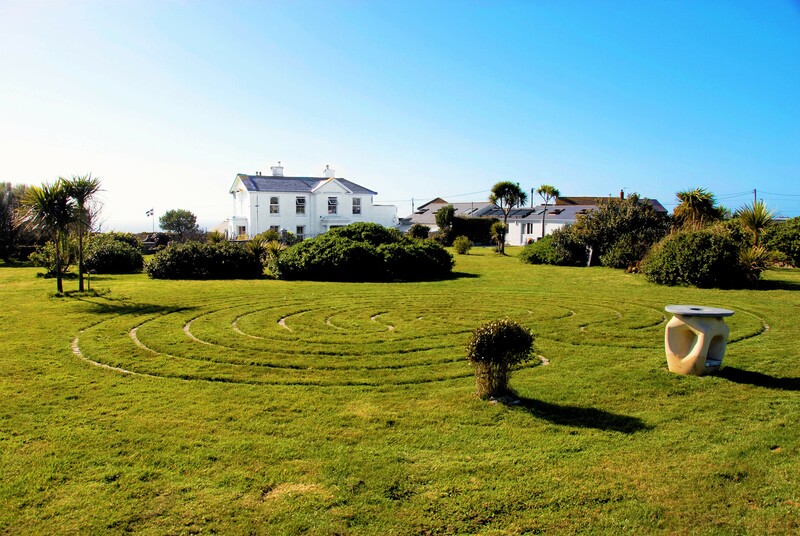 For our rejuvenating, DELICIOUS and inspiring Healthy Plant-based Cooking & Yoga Holiday on the beautiful Cornish coastline. 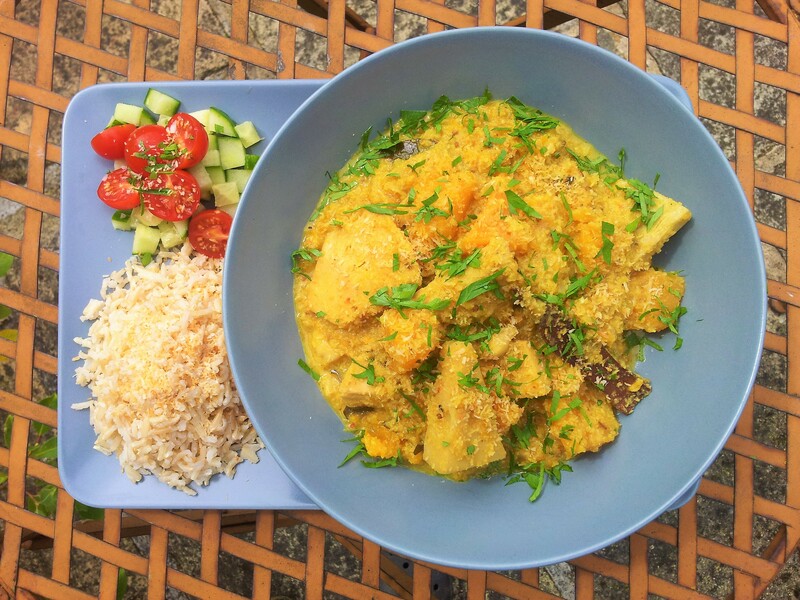 Learn to cook amazing plant-based treats with Jane and I, practice soothing and empowering yoga with the brilliant Complete Unity Yoga, take walks along the stunning Cornish coastline, also BBQ, music, massage and other therapies, swimming pool and inspiring workshops with Jane, Woman’s Wheel. This weekend promises new skills and perspectives, fresh insight and recipes, plus lots of fun and peaceful times. You’ll take away a bespoke recipe booklet, with nutritional advice, so you can cook healthy and hearty vegan meals at home. We are sure these rare opportunities will be snapped up very soon, don’t delay! Please feel free to share this with like-minded friends, curious cooks and all those seeking some peace, happiness and very tasty food! All the detail, prices etc can be found on the Facebook Event Page. 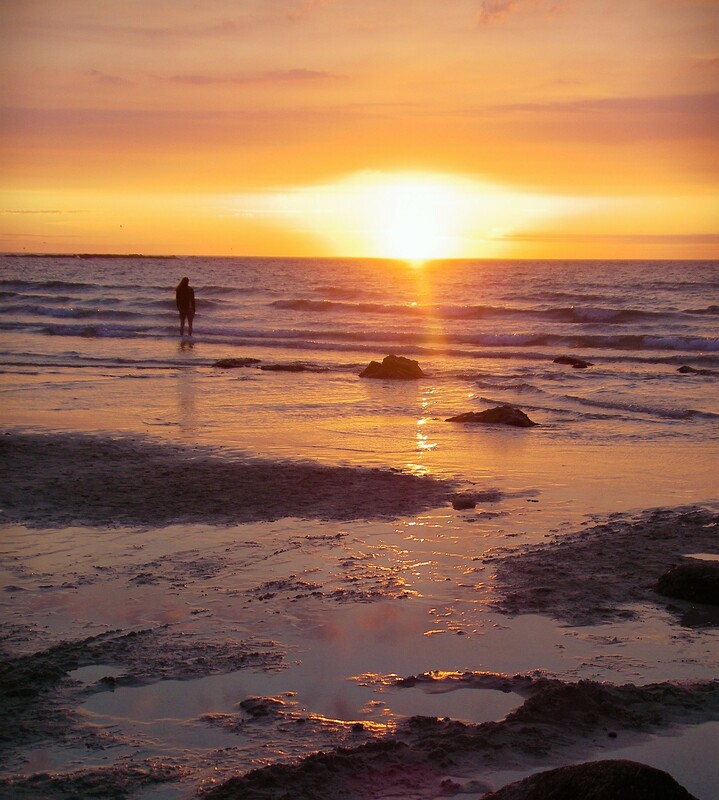 We hope to see you soon in Cornwall, or later in the year at one of our upcoming events, workshops, or holidays. Keep up to date with our future events in the UK and Europe, join our Vegan Cooking Group. 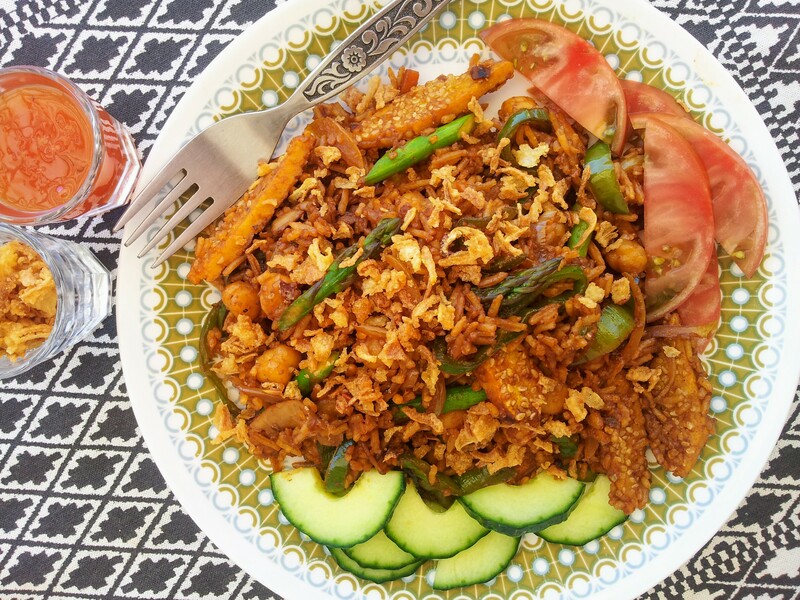 There’s so much in this dish to get the tastebuds jumping; sesame pancake, oyster mushrooms, asparagus, ginger, crispy onions, deep and dark soya sauce……this is a quick lunch and an amazing way to treat leftover rice and veggies. We all need a good, simple fried rice recipe under our aprons, in our cutlery draws or tucked away behind our chopping boards. Super quick and tasty, some would say mega!! This rice is something everyone will enjoy, packed with veggies and big flavours. The sesame pancake is one of the stars here, it really adds something to the dish, giving it a change-up in texture and flavour. It’s also very easy to get together and can be used in many dishes in many ways. They’re great by themselves and are basically just a small cup of gram (chickpea flour). Surely one of my favourite ingredients. I was raised, for a chunk of my childhood in the Philippines, I just cooked this dish for Mum who says that it’s similar to my favourite Filipino fried rice that I ate breakfast, lunch and dinner as a nipper. I’ve always loved trying new and exciting dishes. Although this is a staple dish, we can take it in so many directions. We eat it as a weekend treat in the Beach House, I like it especially in the mornings. A big chilli hit in the AM beats an espresso any day! Anyone else like fried rice for breakfast? Use any array of veggies you like here, whatever is seasonal or hanging out in your veg tray/ basket. 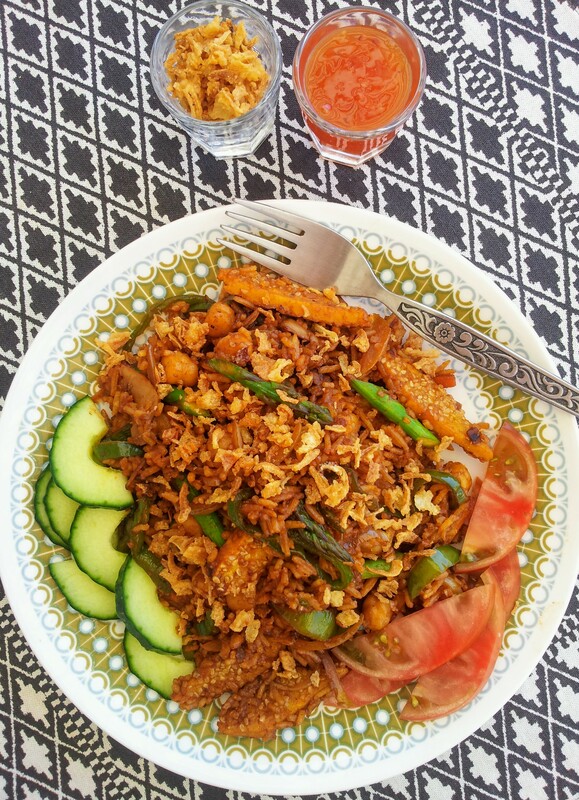 This is similar to Nasi Goreng which is the ubiquitous vegan go-to dish in Indonesia, a country that Jane and I love deeply (see some our travel stories, street food or visiting tofu village). I think it’s just as good without the fish sauce and Kecap Manis, which is a sweet soya sauce (I’m in Spain, so needed to improvise). 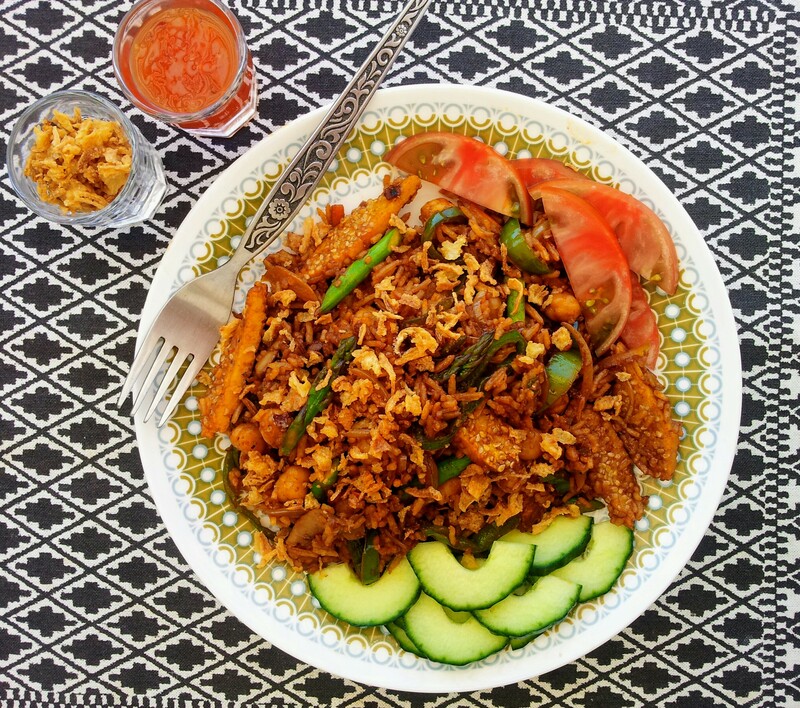 This style of rice dish is awesome with some aromatic paste, South East Asia style, probably the eastiest to get our hands on is Thai pastes, yellow, green or red. A couple of tablespoons will do the trick. But maybe you’d like to make your own, there are some good looking recipes for Basa Gede – Balanese Paste that are exciting me right now. Must try soon, when lemongrass and the like are back on the menu. 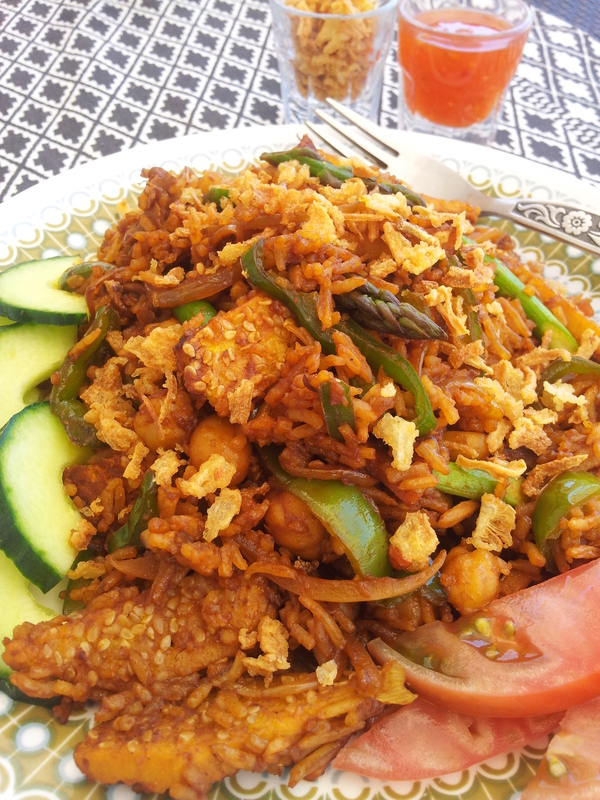 This is an awesome leftovers dish, using up rice cooked for something else. If you’re cooking the rice especially for the dish, make sure it’s fully cooled first. I always think fried rice is best when the rice has sat in the fridge overnight. The best way to cool rice at home is to spread it our on a baking tray, it will cook much quicker than being left in the pan. Rice needs to be cooled as quick as possible and then stored in the fridge. Fried rice should be eaten straight away and not re-heated. I’m doing a load of recipe testing and menu planning for the late summer and autumn at the minute, loving it!! It can be so inspiring, but I’ve got to say, challenging too. The success rate yesterday was less than 50/50. Some dishes just seem to work in the head and in the pan/ oven/ mouth, just don’t work out. This is a dish we cooked today for a quick lunch between recipe testing and the one I decided to share! Such is life. My favourite dishes tend to be the simple ones and when you look at our favourite dishes, from all over the world, it seems that that is just the way we’re wired up. Don’t miss out on news and recipes, sign up for our newsletter. Our Vegan Cooking Group is a place to meet likeminded cooks and share recipes and pictures, ask questions and pick up top tips. You’ll also here first about any Beach House Kitchen events, loads of news coming soon (just tying up a few loose noodles). This dish is so simple and versatile, hope you get to give it a go! Any long grain rice will do here, whatever you like best. Add more chillies, I dare you! I love this dish fiery!! If you’re cooking your own rice, roughly 140g of uncooked rice will make 400-ish g of cooked. Add whatever veggies you fancy to this, in fact normally, we add two or three more types to this dish. To make this Mega Rice gluten-free, you can buy gluten-free soya sauce or tamari. Fried Rice 101 – get all your ingredients and chopping done before you start cooking, makes things a cool breeze as opposed to a potential heated stress-fest! Add the ingredients for the pancake, except the sesame seeds, into a bowl, gradually add the water, stirring as you go to make a smooth batter. Grab a large, non-stick, frying pan/ wok, add 1/2 tbs oil, place on a medium high heat. When the oil is warm, pour the batter mix into the centre of the pan, swirling the pan to make a thin pancake. Cook for 1-2 minutes, halfway through that time, sprinkle over the sesame seeds to give the pancake a good covering. Now flip the pancake using a spatula. Cook for another minute, then set aside. Give the pan a quick clean out. Return the pan to the heat, add 1 tbs cooking oil, when hot, add the onions, ginger, garlic and carrots. Toss and fry for 2 minutes, then add the mushrooms, dried chillies and peppers, cook for another 2 minutes, now add the passata, soya sauce, chickpeas, rice and asparagus. Stir gently and warm through fully for 2-3 minutes, making sure nothing stickes to the bottom of the pan. Taste the rice, add a touch more soya sauce or salt for seasoning. Chop up the pancake into strips and stir into the rice. 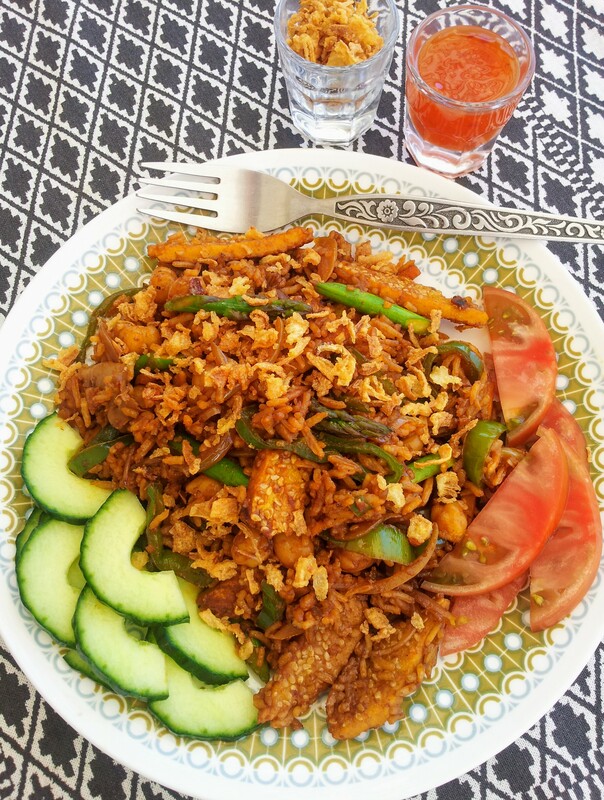 Serve straight away with crunchy veggies like tomatoes and cucumber, chilli sauce, crispy onions and a twist of lime is delicious. Chillies have outrageously high levels of vitamin C, plus decent amounts of vitamin A, K and B-6. Vitamin C wise, they leave the oranges in the shade. Summer’s here, the sun is out and we all need more choc ices in our lives. These are a delicious version with a Middle Eastern twist. Something a little different and a little familiar. Kids love them and they are actually very healthy. Hah! I know that might put some of you off but please come back, give them a go, I promise you’ll be hmmmmming soon. I love Lebanon! I also love choc ices!! And here we are. This is a recipe I make regularly and most people seem to love. 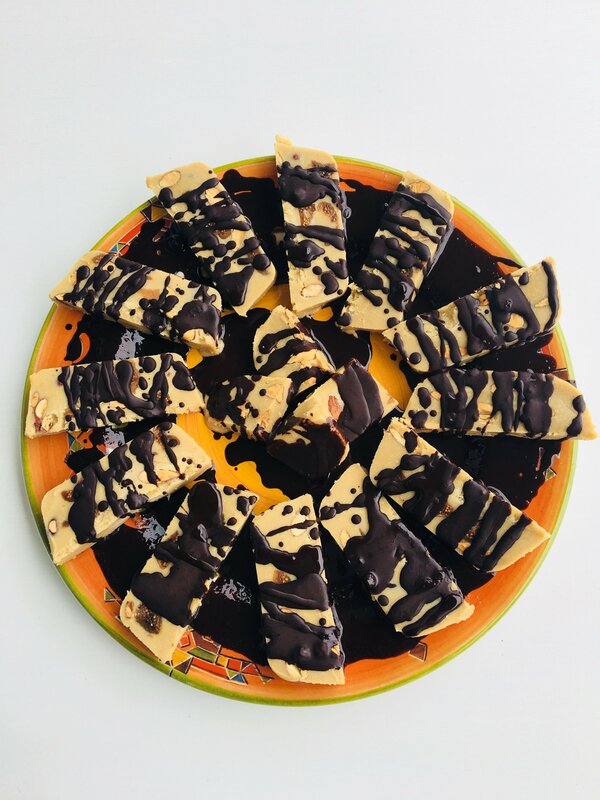 Rich, creamy (from the tahini and coconut oil), sweet with a little crunch (maple syrup and toasted almonds) and coated in dark and crunchy chocolate. Who’s into that then!!? Plus, so easy to make and just sits in the freezer demanding to be munched with smiles. It’s a sugar free dessert recipe, plus vegan and gluten-free so the vast majority of people are invited to this chocolate coated party. 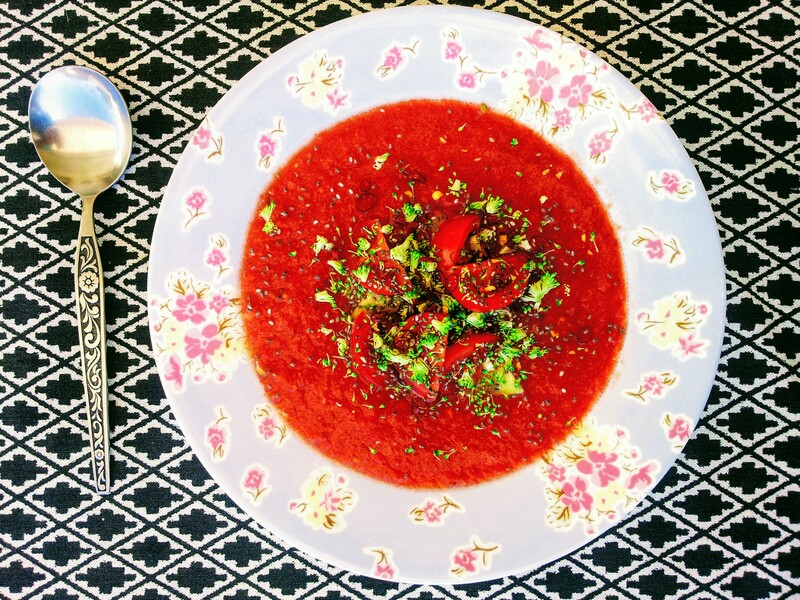 I’ve had a few requests recently for this recipe, especially from the Taste of Bliss group. The recipe can and does change regularly, the fillings can be anything you like. 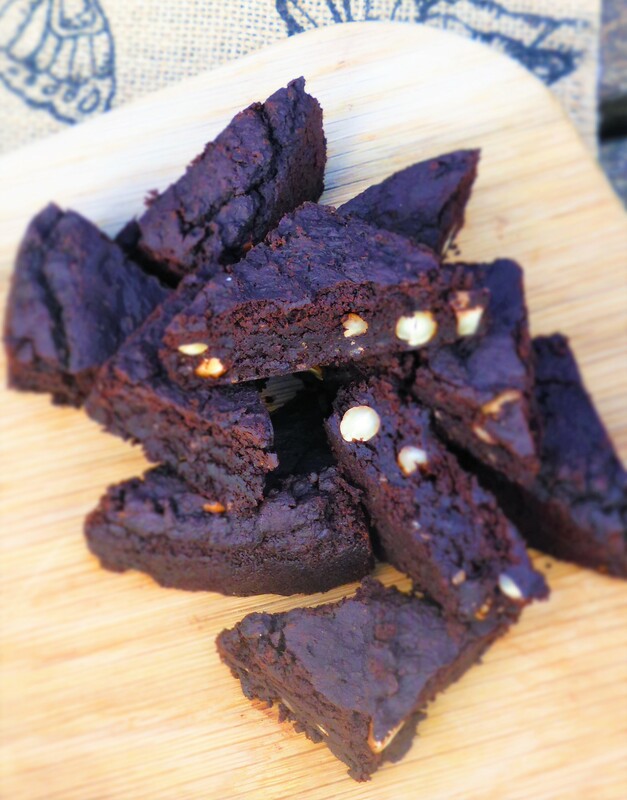 It is delicious without the almonds and figs for example, or you can add more chocolate (never a bad idea), pistachios, top with rose petals….. It may sound strange, but salt is important in desserts, especially here. Please don’t skip it, a little pinch of salt transforms the flavours in these choc ices. Not keen on rose? Many people aren’t. I’d recommend omitting it or adding a little orange blossom water instead. Halva – Melt the coconut oil, you can warm it gently in a saucepan or place the jar in boiling water, then allow to cool to room temperature. Mix the coconut oil with all the other ingredients together in a bowl. Told you it was easy!! Taste the mix now, make sure it is sweet enough for you, or has enough rose. Line a 9 inch-ish by 6 inch-ish rectangular container with cling film. Pour in the halva mix, smoothing over the top with the back of a spoon. Freeze for 1-2 hours or more. Chocolate – Stir together the chocolate ingredients in a bowl until well combined. Now, cut the halva into 12-14 small bars, and place on baking parchment in a large tuppperware style container, suitable for the freezer. Using a fork or toothpick, dip each halva into the chocolate, coat well, and place back in the container. Cover the container and freeze. Leave to sit outside of the freezer 10 minutes before serving. Or, like the photo here, cut the choc ices and then simply drizzle over the chocolate sauce which will set very soon after. This technique looks nicer. Hard to know where to start with these desserts. 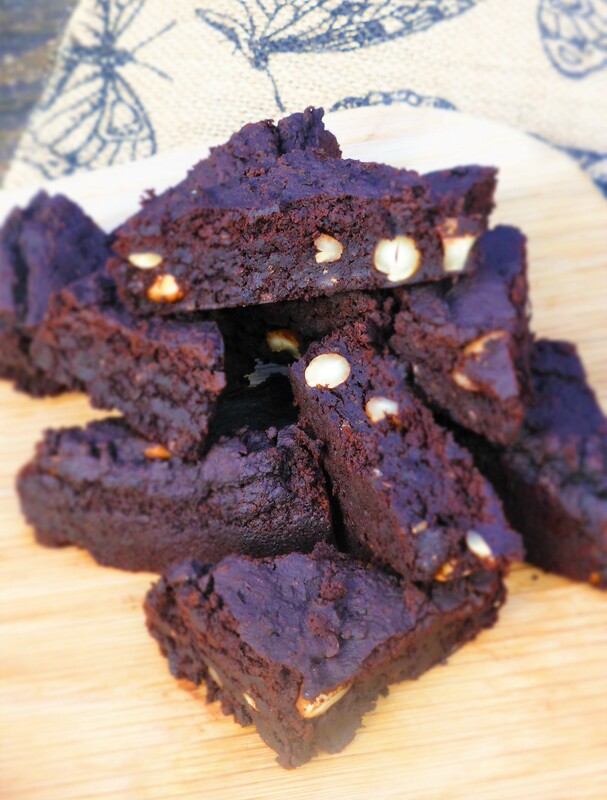 Tahini, cacao, coconut oil, almonds, figs….they definitely sit in a very sweet spot between decadent and healthy eats. 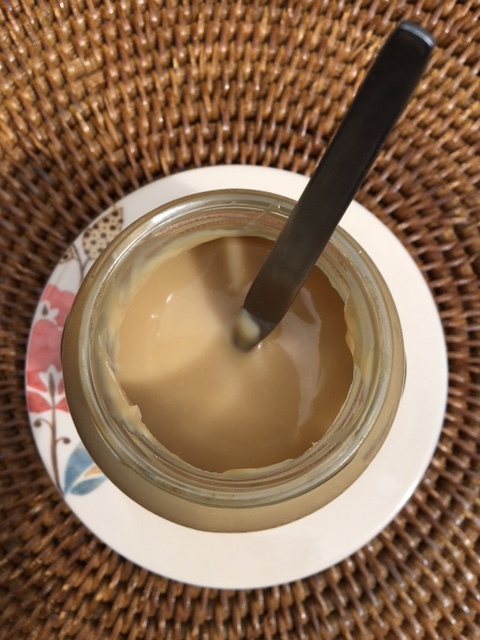 Tahini is very high in calcium, almost three times more than milk for example. Cacao is very high in anti-oxidants and almonds are tops for protein, magnesium and potassium. Figs are full of beneficial minerals and vitamins and a healthy dose of fibre. Overall, this is probably the healthiest dessert I’ve ever made this side of a fruit salad! Simple Green Pea Hummus – Goodbye Chickpeas! 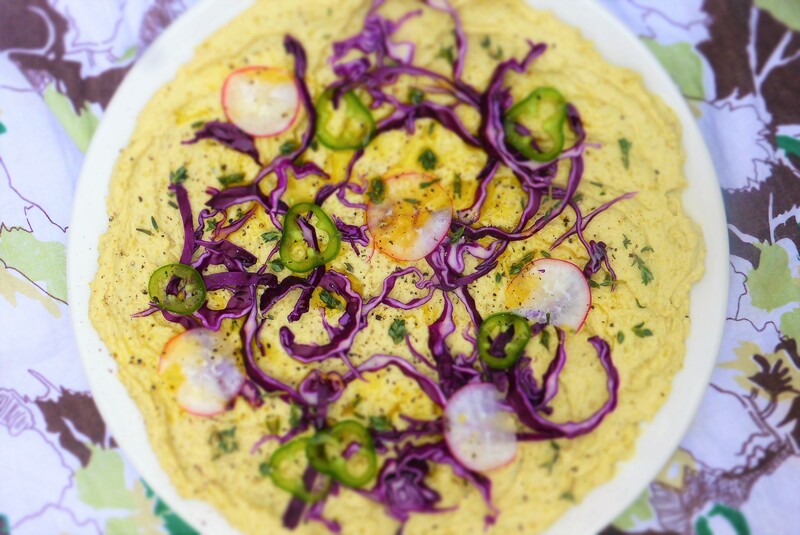 Jane said, “This is the best hummus you’ve ever made!” So I had to share this recipe with you. Jane is, after all, one of the leading hummus connoisseur in the North Wales area. This hummus is creamy and rich and doesn’t taste overly pea-y, if that’s something that may concern you. Cooking the split peas requires no soaking, so it’s quicker than making proper chickpea hummus, which I always make with dried chickpeas. I think the flavour is better from dried pulses. There was a rumour that the price of chickpeas was about to sky rocket. I haven’t seen it yet, but the cost of food does seem to be going up gradually and may continue. 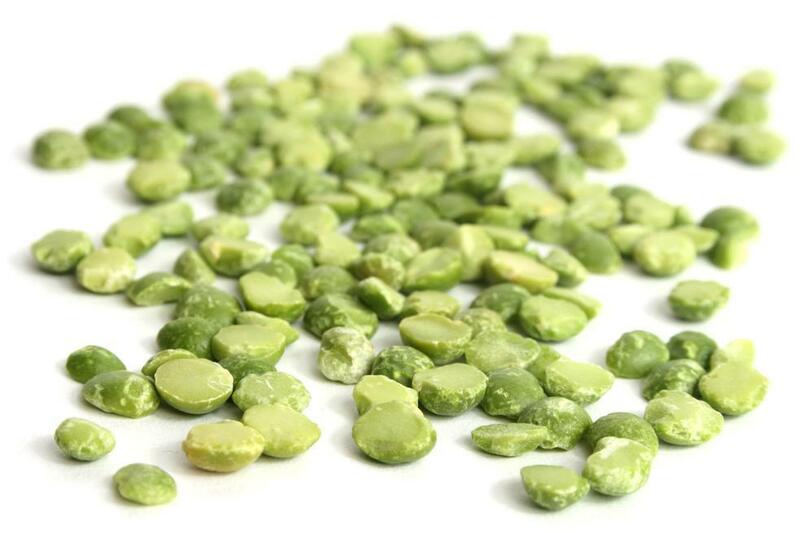 These green split peas are grown in the UK and are a good, inexpensive option, plus they’re packed with nutrition. My roots are in Durham, North East England, an area with lots of tasty traditional dishes. Pease Pudding has to be one of my favourite. Like Durham’s answer to hummus really. Normally just cooked split peas, flavoured with meat, I love to make it flavoured with all kinds of cool herbs and spices, roasted veggies. It’s normally served on stottie cake (big flat Durham buns) with pickled beetroot and ham. I can see this being veganize-able very easily. Having said that and even though I am partisan to all things Durham, Pease Pudding doesn’t come close to this hummus. Sorry Mum. These lovely British organic split peas deserved a fitting topping, so I wanted to use local and seasonal veggies too. You could opt for any topping, or none, but bar the chillies, the toppings reflect North Wales right now, just as Spring is getting into gear. Toasted walnuts or hazelnuts would be a nice addition. Maybe we won’t be saying goodbye to chickpeas for ever, but for the forseeable future, we’re all about split green peas in the Beach House. Never thought I’d say that, but they make a fine hummus. Hummus can be eaten warm, why not!? It’s lovely just don’t let the beans cool and blend and flavour as usual. Makes a nice change. This is the basic recipe, but we love adding blanched greens to the hummus and blending. Also, spicing it up with a little ground cumin is very nice. If you only have yellow split peas, they will be fine in this recipe. I find hummus changes overnight. The flavours mingle and come to life. If you can resist, make it the day before and watch how those flavours shine. Cook your green peas, they won’t need soaking. Give them a rinse, cover with plenty of water and bring to a boil, leave to simmer for 10 minutes, set aside for 1 hour. Then cook on a low simmer for 30 – 45 minutes, until they’re nice and tender but not one big mush. Add water as you need it. Or alternatively, just follow the handy instructions on your packet. Leave the peas to cool. Add all the ingredients to a blender and blitz, checking the seasoning. Blend for a while, until it’s really nice and smooth. This is a thick hummus, you can add a drizzle of water if you like your hummus a little thinner and lighter. Serve in a bowl, or spread it out over a plate, I prefer the latter. Scatter over your toppings and serve as you love your hummus most. High in protein and low in fat, plus they are one of the highest sources of fibre. Easter’s here! Any reason to celebrate and feast right! 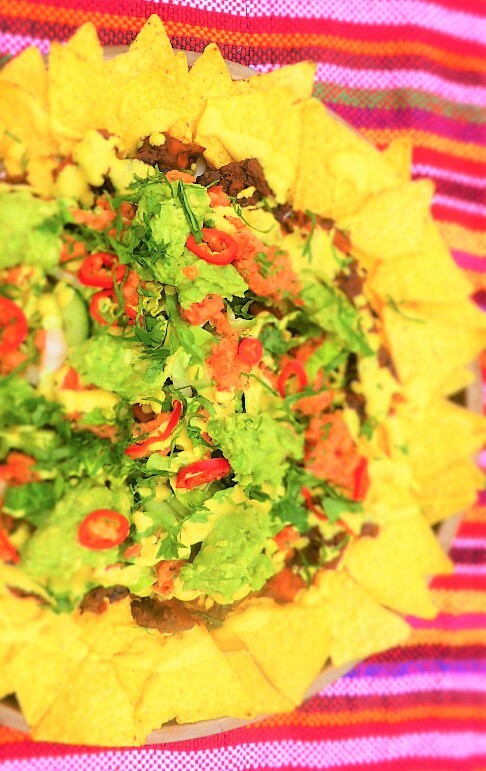 These nachos are maybe how they’d celebrate in Bogota or Cartagena? Let us know in the comments if you’re in Columbia! This is a celebration on a plate! These nachos are fully loaded with all the goodies we know and love and the Frijoles Rojos (Red Beans) are such a simple way to make a spicy, tasty bean dish. Years ago, I lived beside a few Columbian restaurants in Brixton. I’ve loved the food ever since. Everyone enjoys this dish! All those colours, flavours and textures. It’s a winner! 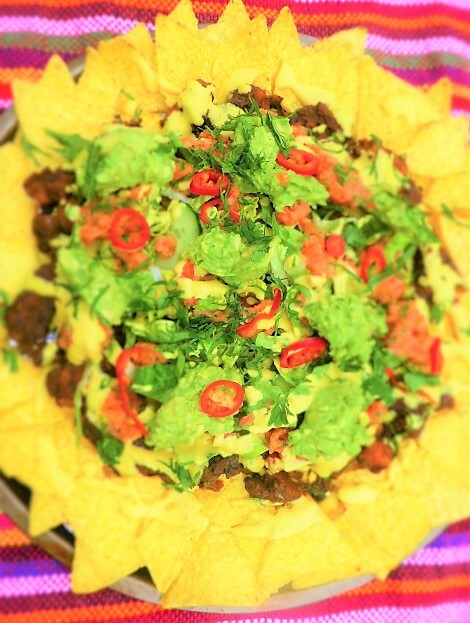 The rich and spicy beans, the crunch of the nachos, the creamy smoky dip, avocado, coriander, maybe a twist of lime. Come on! That’s something pretty special. 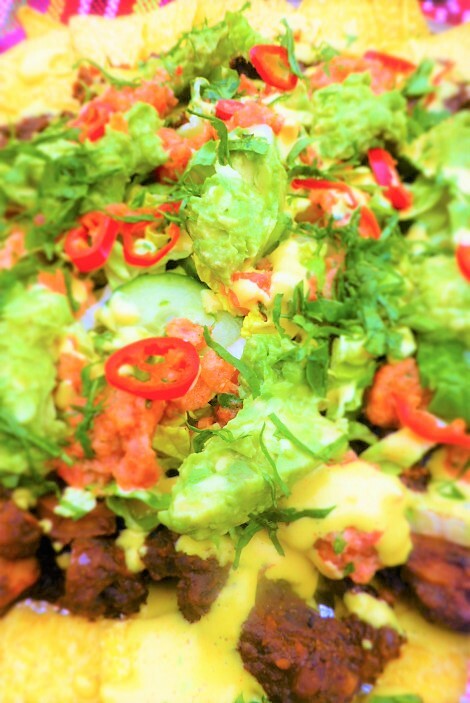 Fully Loaded Nachoes will brighten up any Easter feast and generally go down very well in the BHK, whenever we make nachos, they last approx 3 1/2 minutes. Woof. Gone. It’s a communal dish that I love, as a cook, I can think of few things better than sharing food. This is best served warm on a large plate or platter. If you are looking for something a little different and healthier, just sub the nachos/ tortilla chips with toasted soft tortillas (tostadas), cut into little triangles. This is also a lovely way of serving these beans and traditional too (although the tortillas may be fried). Usually, you might find things like beef and dairy cheese in this dish, we’ve ditched those of course, replaced with mega beans and creamy cashew cheeze. Nacho cheese is generally a day-glo orange brick, something like vulcanized rubber meets food, totally overly processed and flavour-less if my memory is right. Much better with the creamy cashews, Chipotle & Cashew Queso Dip recipe here. This is one of those dishes which skirts between meal and snack. I think most of us would be quite happy to live on nachos!! I think it’s great party dish, something that can fill the belly, tickle the tastebuds, but really, you don’t need a lot of it to feel satisfied. Maybe thats down to the sheer volume of flavours and the beans and toppings are all really nutritious, maybe the belly is satisfied because this dish is so dang tasty!? When I was traveling around Mexico and Central America, I didn’t have many nachos. Is there anyone here from Columbia? How do you feel about nachos? It seems more of a Northern Mexican/ Tex Mex dish that has probably caught on in many countries because it’s just an amazing combo. Wikipedia says that the dish was created by Ignacio “Nacho” Anaya in about 1943 in Northern Mexico. There we are. A very tasty piece of history. Variations on the nacho theme, I’ve read that in America there are things called S’mores Nachos, graham crackers, chocolate and marshmallows. I’ve had S’mores in the past, they were built up like some kind of ‘food for the Gods’, they’re not. In Hawaii, they put pineapple on nachos. I am sure that surprises no one. Sounds good though. I like Hodemdod’s beans. Most of their beans and bits are grown organically in the UK. Their Red Haricot beans will be perfect for these Columbian Frijoles. If you live on this here, fair island (Britain) check em out. Plant based people thrive on good pulses! They make all the difference. Fully loaded is one thing, but just the nachos and beans makes for a lovely meal/ snack. You can add what you like on top, pineapple (A Hawain twist), bbq or chilli sauce, guacamole, sour cream, more cheese, pickled jalapenos…. Corn Tortillas/ Nachos are what we use here, they’re normally gluten-free, but check the packet. Not into tortilla chips, this dish can be made into a main course when served with rice, mashed sweet potato, roast potatoes (with a touch of cumin), a nice big, crispy salad. In a large saucepan, add the cooking oil and fry the onion until soft, 5 minutes. Add the other veggies fry for a minute then add the spices, garlic powder and oregano, fry for another minute, then add the tomatoes and beans. Cover and simmer for 25 minutes, adding roughly 350ml water to form a nice, thick sauce. Stir a few times. Season with salt. Toss all together in a small bowl or blend together in a food processor, changes up the texture a little. You can warm the nachos/ tortillas in the oven for 5-10 minutes. This is nice. Spread the nachos/ tortillas on a large plate/ platter, top with the beans, then scatter with salsa, queso and the rest of your toppings. Normally I make enough for two plates, you’ll have enough beans for this. One plate of nachos is never enough!! 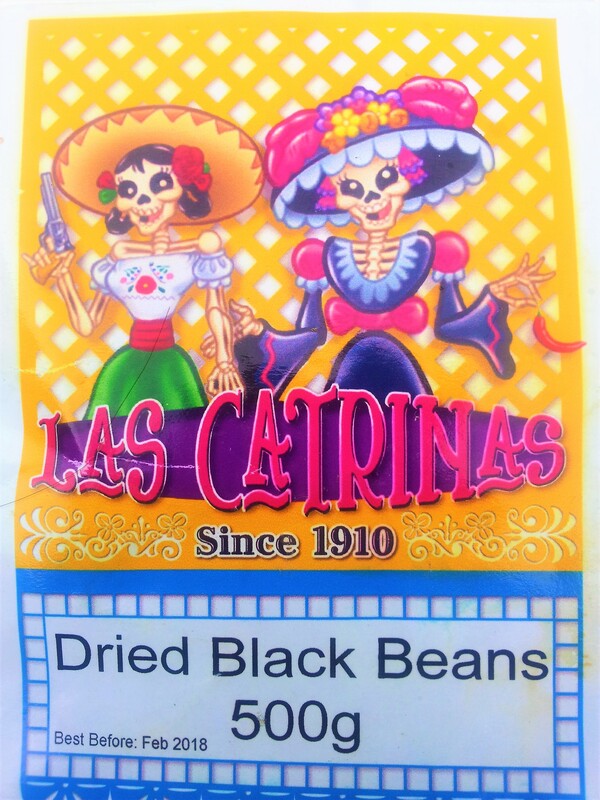 Red kidney beans are originally from Central America/ Mexico and are quite an ingredient! 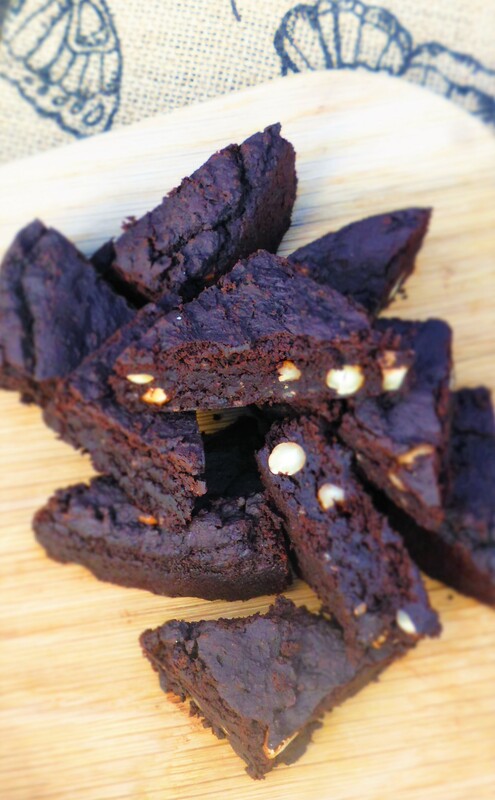 Not only do they have that lovely, deep flavour, they are one of the richest sources of plant-based protein. They are filled with fibre, which helps the body detox and are high in carbs, good ones, slow-release, meaning they’re a great source of energy. They’re also rich in folates, iron, copper, potassium and loads more vitamins and minerals. They’re known to be a weight loss friendly food. Not bad for a humble little bean! Remember to soak, drain and wash your beans well before cooking, if using dried beans. If you like this recipe subscribe to our newsletter or follow us on Facebook for more news and recipes from the Beach House Kitchen. Feel free to share this recipe and let us know your feedback in the comments below. We love to hear from you! 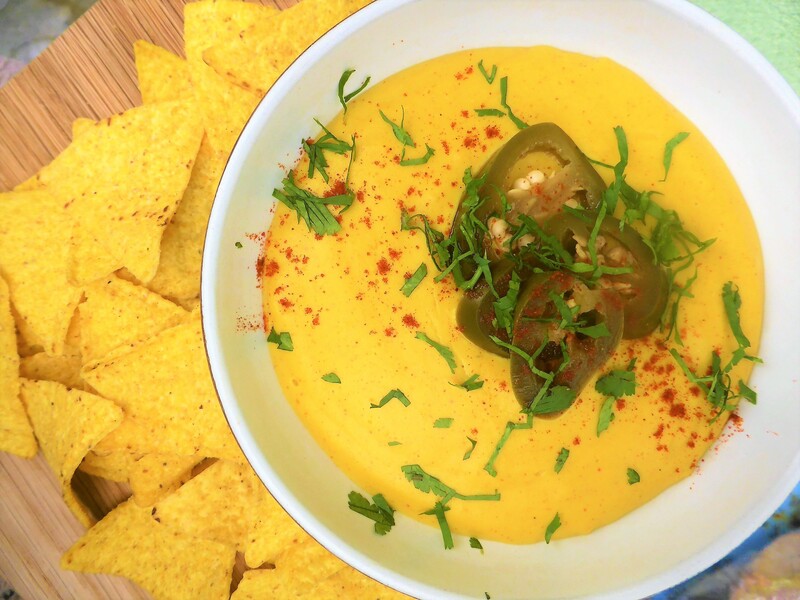 Vegan Cashew Queso – Get Dippin’!! Treat your nachos/ tortilla/ enchilladas (anything you fancy really) to this creamy, smoky queso! 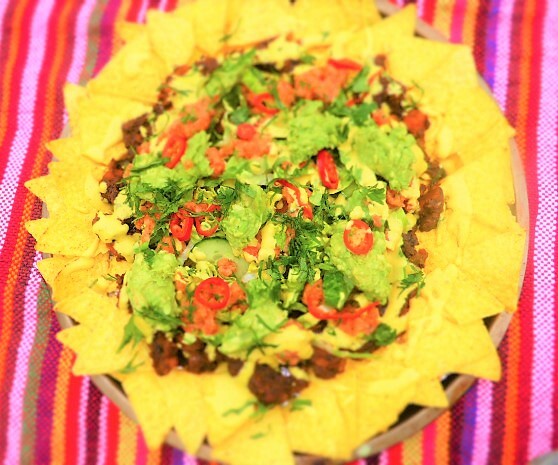 This is a classic tex mex style dip gone vegan, it has a lovely thick texture that clings to your nachos and it’s a load healthier too. Chilli con Queso (basically cheese plus chillies) is the national dish of Texas (Texas is a nation isn’t it?!) That’s what I’ve been told….. Either way, the lone star state is pretty obsessed with this creamy, dippy, lovely stuff. We love it poured over spicy sweet potato fries, now your nibblin’. I’ve also found it makes an interesting twist on Welsh Rarebit…Texas Titbit? Serve with your favourite Mexican style bean dish, this queso takes yum wherever it goes. 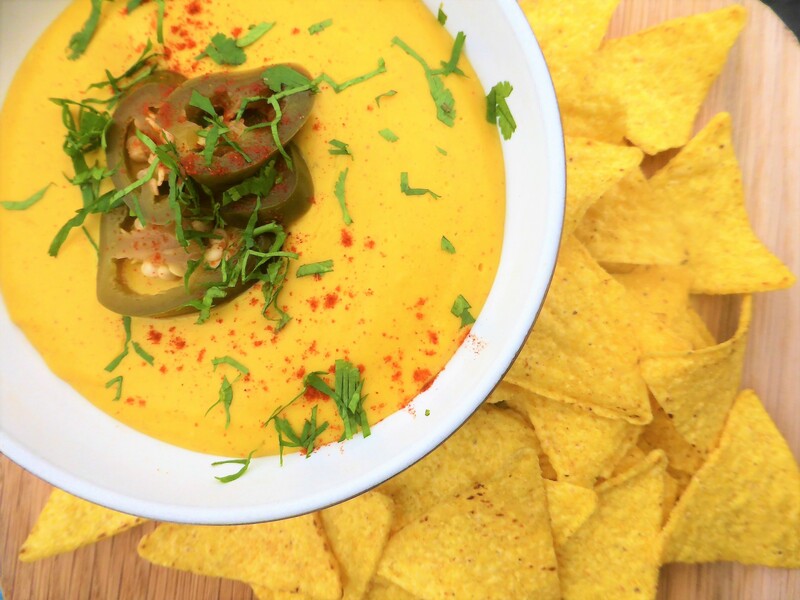 There are loads of ways of making a comforting vegan queso, but I like this one because it’s simple and uses easy to find ingredients. You can add to it what you like, I’ve heard people are making kimhci queso! But let’s face it, Kimchi goes well in most things. There’s nothing flashy here, but it tastes goooooodd! In the realm of dips, this is way up there for me. 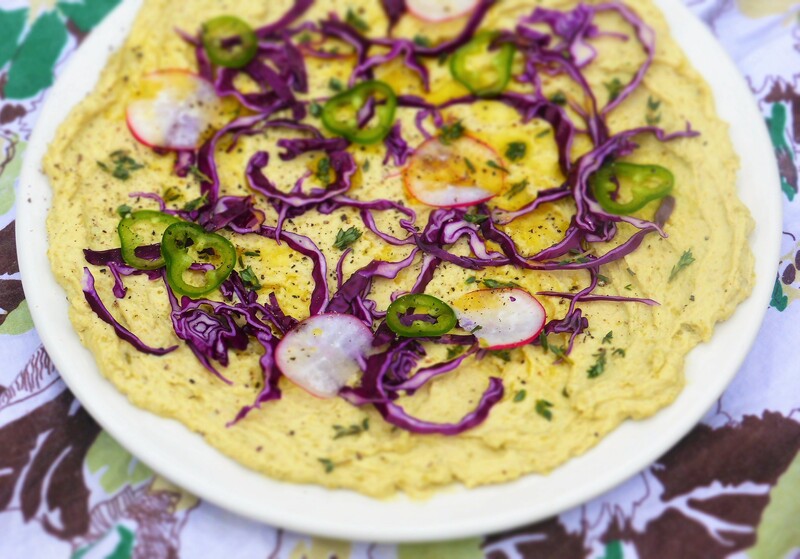 Like a Texan hummus, a sunshine guac, but calling these dishes ‘dips’ seems to belittle them. What do you think? 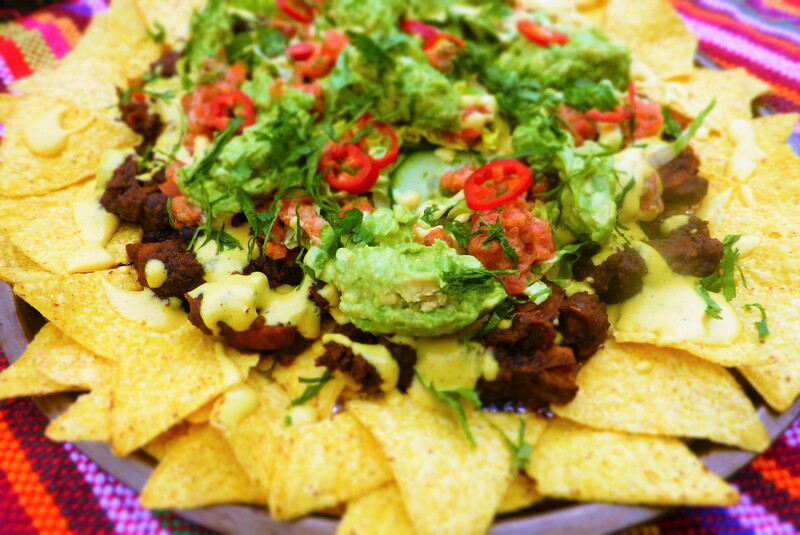 Nachos have always been a thing with me, I think there just perfect party food, they’re fun (Jane disagrees) and a mountain of nachos is perfect for sharing and enjoying with drinks and a giggle. Why is that? I think it’s the sharing aspect. Communal nibbles. I’ve always preferred sharing food, when we go to restaurants, I’m that guy who wants to taste everyone else’s food. Hah! You have been warned…..
Thing about ‘normal’ queso is that its made with processed, ultra orange, cheese. Bahhh! 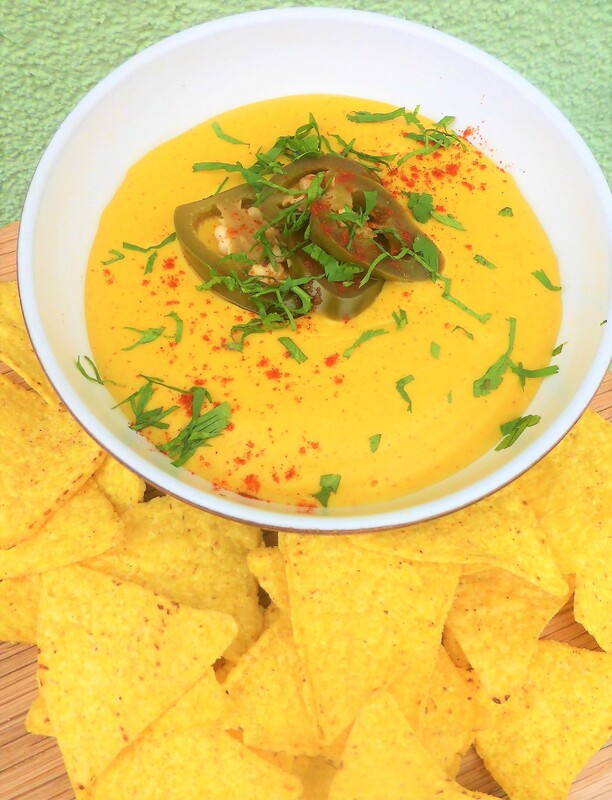 This queso recipe has cashews which are creamy and lovely and packed with healthy stuff, also tapioca flour, gluten-free and a good source of carbs, chillies (super high in vitamin C), turmeric (outrageously good for us), paprika (see chillies), garlic…..you get the idea, this is a super healthy dip. But, it tastes creamy and delicious too. I have limited queso experience but I have fortunately been to Mexico, from North to South, totally awesome country and such a diverse food culture. I travelled up along the border with the US, which can be a pretty dicey and spicy place in some towns and for a clueless wanderer, it was an eye opener. But the nachos were always sensational. I’d only known nachos from the UK, as say Doritos, but never with all the add ons and embellishments. Making this queso really got my tex mex hat twitching, I’m going to do my fully loaded nachos for you, watch this little ol’ space. They’re coming….. I use tapioca starch here, many use corn starch, but tapioca gives it a really nice stringy, thick texture. I’ve made mozzarella style cheese with tapioca starch, Moxarella recipe here, it really is a genius ingredient. You’ll find it in health food shops across the land for sure. Of course, you can order it online, we get ours from Suma but they do a minimum order. Check out the website here, get some friends together and put an order in. Suma will also sort you out with all those tricky to get vegan products that you may be struggling with. We’re not sponsored in anyway by Suma, we just think they’re great. We’re not sponsored by anyone actually! The BHK is free!! If you like what you see here, let us know in the comments below. Are you in Texas? Are you in Mexico? Are you in Wales? If you have a really good blender, you don’t even need to soak the cashews, although soaking nuts is good for your health. See what we wrote about that here. If you’re not a chilli/smoky fan, leave out the chipotle, it’s still really tasty. This queso is quite thick, just stir in more milk or water when you’re cooking to make it thinner, like a pourable, double cream consistency is nice drizzled over nachos (Fully Loaded Nachos coming soon). We want a nice kick of chilli here, go for it! Chipotle chilli paste, you’ll find in most supermarkets. Stir it into stews and soups for lovely smokiness with chilli-ish benefits. Not into mountains of nachos, toast or grill some corn or wheat tortillas and cut them up into little triangles. Or go for veggies, chop up some of your favs and dip away. 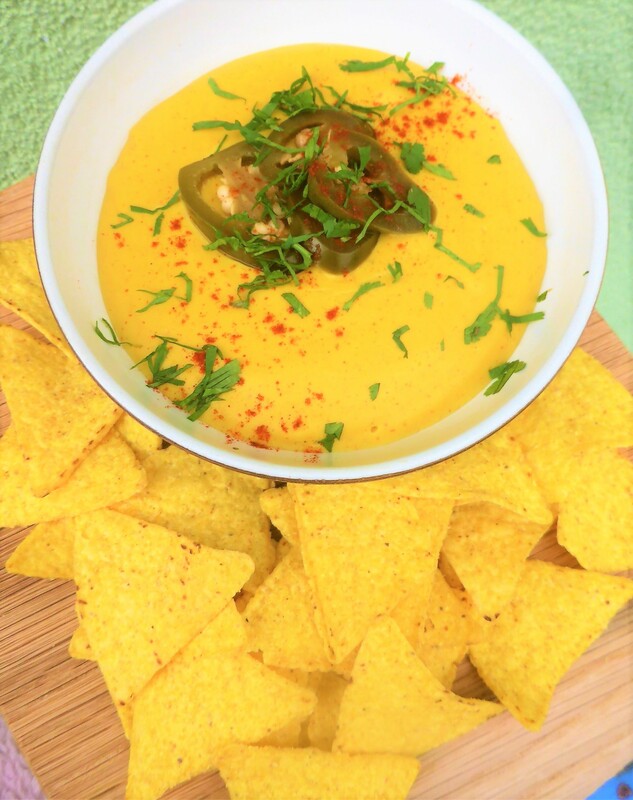 Cashew & Chipotle Queso – Vegan, Gluten-free, low in fat, high in yum! Add all the bits to a blender, except the chipotle paste. Blend until smooth. In a saucepan on medium heat, add the queso and simmer for 8-10 minutes, stirring. Tastes the queso, if it tastes a little chalky due to the starch/ flour, keep stirring and cooking. Taste again, add chipotle paste and more salt as needed. You may like to top with jalapeno chillies, a light dusting of paprika/ cayenne pepper and fresh coriander. Very nice when served warm with nachos/ tortillas. I also like to serve the nachos warm, pop them in a low oven for 5-10 minutes. You can also serve this dip alongside Mexican/ Tex mex style bean dishes, burritos, tacos, quesadillas etc. All very tasty. I love it especially served with a tangy salsa. Cashews are low in fat for a nut and are a good source of protein and iron. Here is our little offering to the coming of Spring. 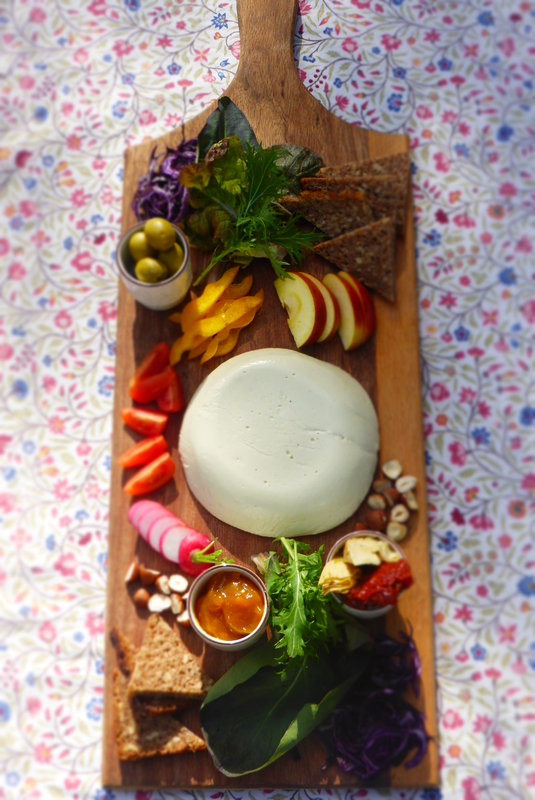 A simple vegan cheese recipe which is so versatile and can be enjoyed on pizza and melts nicely. As you may know, the way a vegan cheese melts can be quite an issue, we don’t want cheese like rubber on our pizzas!! 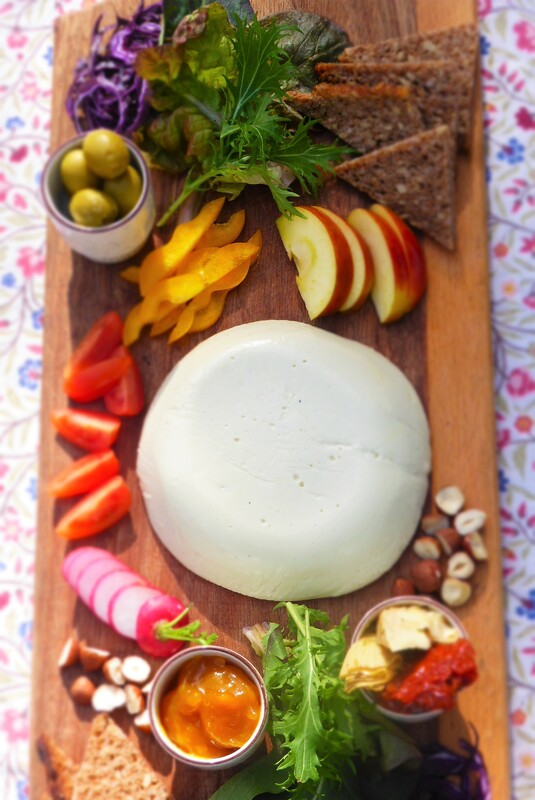 I also like this as it is, especially with these kinds of accompaniments, this is like a rainbow ploughman’s really!! The texture of this cheeze is similar to Mozzarella and the flavour is light. We enjoyed this in the garden, with bright sunshine and birds singing. After the recent snow storms, it really feels like Spring is finally on the way in Snowdonia. We’ll see…. 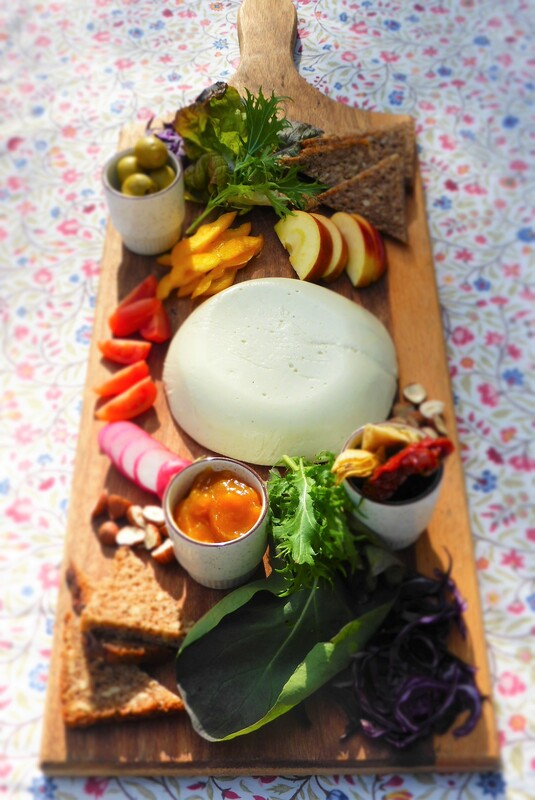 Some vegan cheeses can go a little off piste. Not much like their namesake, cheddar or blue cheese style, you’ve probably been there. But this one delivers! A cheese that is simple to make, pretty healthy actually and also similar in texture and taste to the original. We’re using a handful of cashews here, so don’t expect over to top creaminess, but I love this and for an inexpensive, fuss-free, vegan cheese, I think this is top truckle! 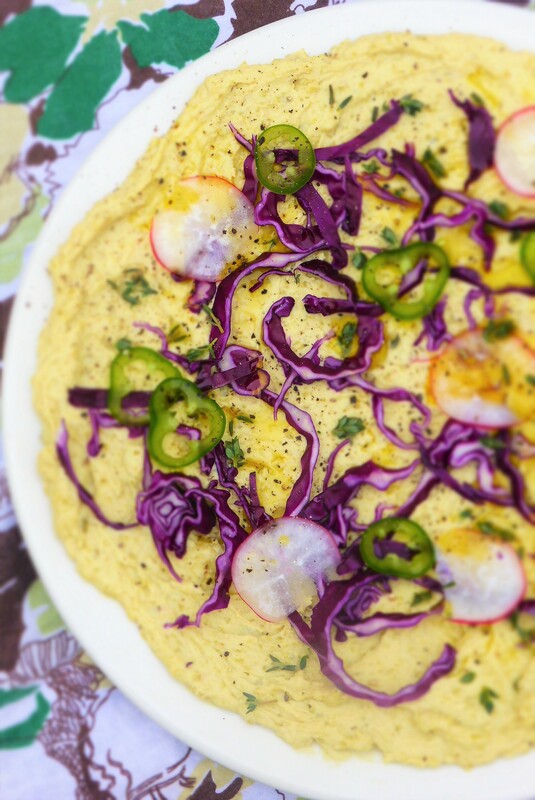 My friend Somer over at Vedged Out (coming straight outta Utah) calls this recipe ‘Foxy Moxy’. Which I like, but when punched into Google, you get some pretty unappetizing results!! So we’ll stick with Moxa. This is basically Somer’s awesome recipe, given a slight tweak, but when a recipe is this good, simple and tasty, why mess with it? Thanks for the inspiration Somer!! Rainbow Platter! Moxarella served with mango and chilli pickle, artichokes, olives, sun dried tomatoes, chopped veggies, salad leaves, hazelnut, German rye bread. Moxarella is so simple to make at home and has the stretchy texture of Mozzarella, coming from the flour we use. You’ll have to seek out some Tapioca Flour, found online or in your local health food shop. You can use other starches/ flours to make cheeses, but this one is the very best for Mozzarella style cheese. I’m going to be sharing one of my favourite Mexican-style Queso recipes soon, where we’ll use corn flour, the texture is subtly different, but perfect for a slightly thinner cheese. It’s exciting playing with these cheese making techniques! If you’ve bought a bag of tapioca flour, you can also use it a a thickener for soups, stews and the like or it adds a really interesting, springy texture to baked goods. Ideal in bread I’ve found. It may be known as ‘Tapioca Starch’ where you are. Same thing. The unusual snowy snap this Sunday forced us to cancel our ‘Food for the Soul – Vegan Cooking and Yoga Day Retreat’ in Mynydd Llandegai. We woke up to a foot of snow outside, an unpleasant surprise. We managed to make it up there, but the mountain roads were pretty frozen and slip slidy. We’ve re-scheduled to the 19th August ’18, booking and info here. A day of healthy soul food cooking, peaceful yoga and meditation and a nourishing lunch. We have a few places available. Contact Claire here to book directly. But now the sun shines and spring is in the air, time to prepare ourselves for picnics and eating outside, what a joy! We’re coming out of the dark winter and bright platters like this really help to wake us up; eyes, tastebuds all tantalised by the colours an textures and it only takes a few minutes to make special. Please feel free to share this recipe and leave us a comment below if your like the look of it or try it out. It’s always wonderful to hear from you! A little more salt and lemon will really bring the flavours out, experiment with your preferred quantities. If you’re not using oil, that’s cool, leave it out, it will still be a hit! Somer likes to add a little nooch (nutritional yeast flakes) to the recipe. If you like them, go for it!! They will add a little more savoury cheesiness. Pour into a saucepan, warm on a medium heat and stir constantly. The mixture will thicken and become gradually more elastic in texture. Keep stirring throughout to ensure the moxarella does not burn on the bottom. Stir and cook for 10-12 minutes until thick and the edges leave the pan. Remember it will firm up even more when cooled. Line a small bowl or ramekins with cling film/ baking parchment, once the cheeze has cooled a little, spoon in the moxarella mix and tap on a surface to remove any air bubbles. Smooth the top with the base of a spoon, once cooled enough, cover and pop in the fridge to set for an hour. Keeps well in the fridge for a few days and can be used for pizza, cheese on toast or on your rainbow ploughmans…….you know how you like your mozza! 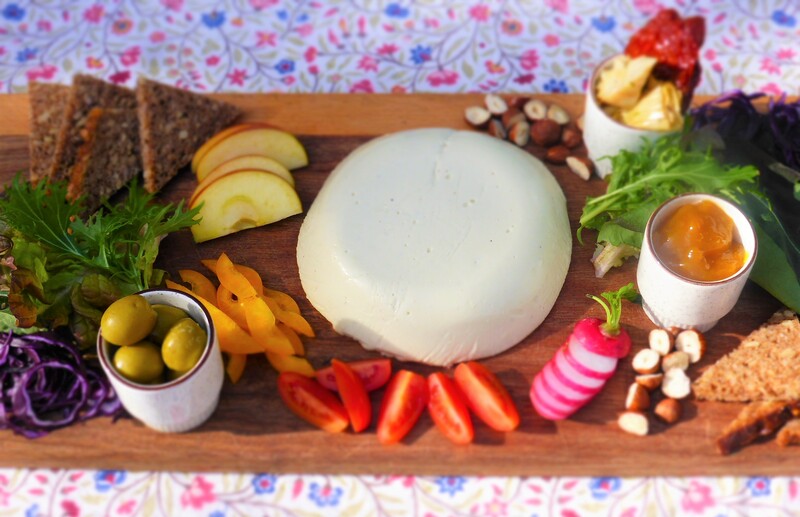 Homemade Vegan Mozzarella – Give it a try! Tapioca flour may be a new one for some of you. Tapioca is made from the root of the Cassava plant, its a big knobbly tuber basically. Being a starch, this is high in carbs and has a smidge of calcium in there. 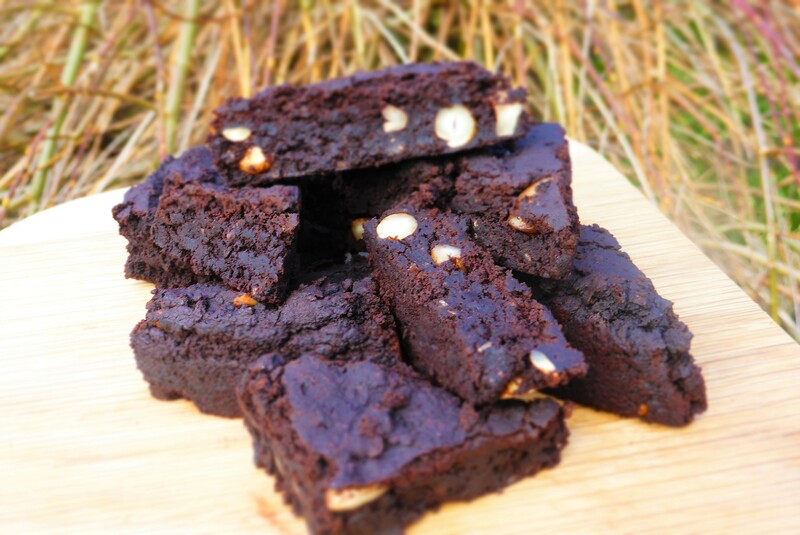 It’s low in calories and fat and is something that will become really popular in vegan/ gluten-free baking I reckon. This curry is totally over the top in all the right ways!! Flavours, intensity, creaminess, coconut! India cooking rocks my world, how about you? Making things like this masala paste at home brings any kitchen to life with incredible colour’s and fragrance. Apparently it’s spring, but looking out the window here in Wales, we’re in serious need of some rainbow food! Some zest and zing, brightness on our plates. This Goan curry is perfect for that! This type of curry takes me right back to Goa, sitting in my favourite little place, right under many jackfruit trees, and eating homemade curries with fresh mango juices. Not a bad life!! It wasn’t jackfruit season, but they were hanging off the trees like strange bright green, spiky alien space craft. If you’ve seen one, you’ll now what I mean. 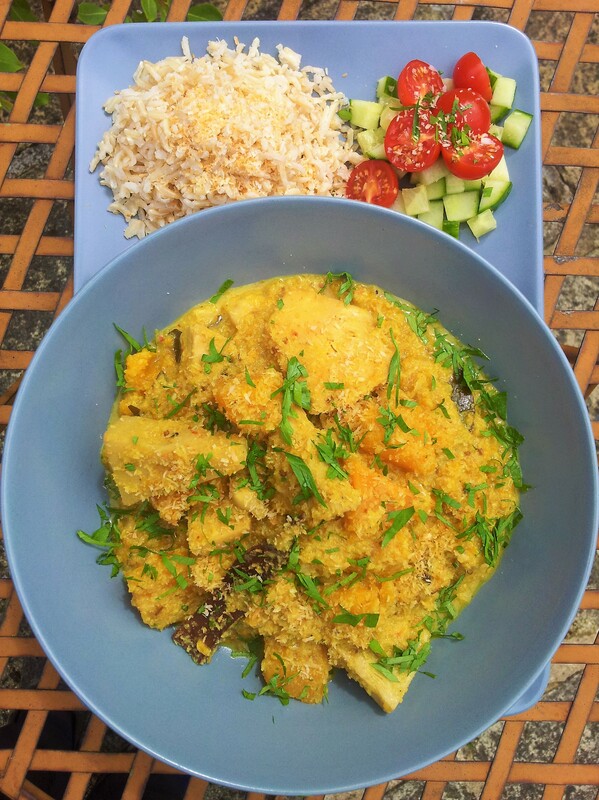 This recipe is based on a selection of curries I ate almost every day for lunch. They were always homemade and you can really taste the difference, the ingredients taste real!! 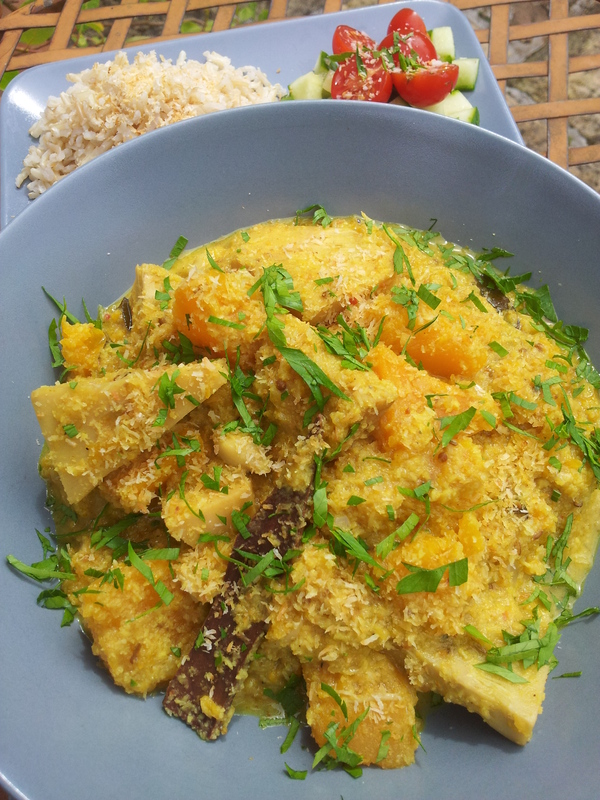 The cooks loved to use coriander seeds, giving their slightly citrus flavour to the curry. I’m not sure if this is classically Goan, but it is how the lovely families cooked. The cuisine of Goa is so diverse, see my post here, ‘A Taste of Goan Cuisine’ for more Goan food tales. Is still a new ingredient for most of us. It doesn’t get much more exotic, it’s a very strange fruit. I love it! Here we use the unripe jackfruit, which many say is a good meat sub, you can also eat the ripe jackfruit which is more like a yellow flower. Both are available in the UK in tins. The ripe jackfruit is better suited to desserts, makes an incredible ice cream and is delicious eaten raw. You will find many street vendours around the world, in Thailand, India etc experty dissecting the giant fruits (the can get massive) and serving the yellow, slightly rubbery flowers on small trays. For a few pennies you can enjoy the totally unique flavour of jackfruits, some say it has a hint of juicy fruit bubblegum in there. I get that. But we’re all about the unripe version here, the one many people are using to replicate pulled pork. It works a treat and meat eaters are easily fooled by it. They certainly enjoy it! Some people have said that we should not eat such an exotic ingredient regularly in the UK. I understand that, but we all love bananas and pineapples and jackfruit I think will always be a treat ingredient for me. Something we use seldomly, a very tasty kitchen curve ball. There is a slight sourness to some Goan curries, it seems to be a legacy of the Portugese, who like adding vinegar to dishes. The sourness here comes in the form of the tamarind, but you can also add a little lemon juice to the curry at the end to give it that extra little twang! Tamarind can be found in world or Indian food stores in its dried state, with the seeds still present. I like it like that. You can also buy the paste in supermarkets. Chillies are up to you. Jane is not a huge fan of chilli, so I really tone things down. I would go for the green chillies and around 4 red dried chillies in this curry. Remember, that many dried red chillies are milder. If you use the equivalent in chilli flakes for example, you may have an incendiary curry on your hands. If you don’t have jackfruit, you can substitute it with any vegetable you like or even a tin of black eyed beans. I really loved the Goan curries made with black eyed beans. Tofu or tempeh would of course be sensational here. I left the jackfruit pieces whole here, but you can chop off the stem if you like and break the jackfruit up into smaller chunks. Like the BBQ Pulled Jackfruit recipe we did a while ago, see here. 1 tbs coconut sugar, brown rice syrup, sweetener of your choice. Goan cuisine is so interesting, filled with unique flavours and tropical twists! Press the jackfruit between kitchen paper to draw out some of the water. This leaves more room for flavours to infuse and get in. Put all masala ingredients into a blender, I use a small blender (I have one that attaches to a stick blender), I find it easier to do this in a smaller blender. Blitz up and gradually add roughly 125 ml coconut milk to the masala as you blitz and scrape down the sides of the blender until all is combined. You should have a smooth sauce, the better and more powerful your blender, the smoother the paste. 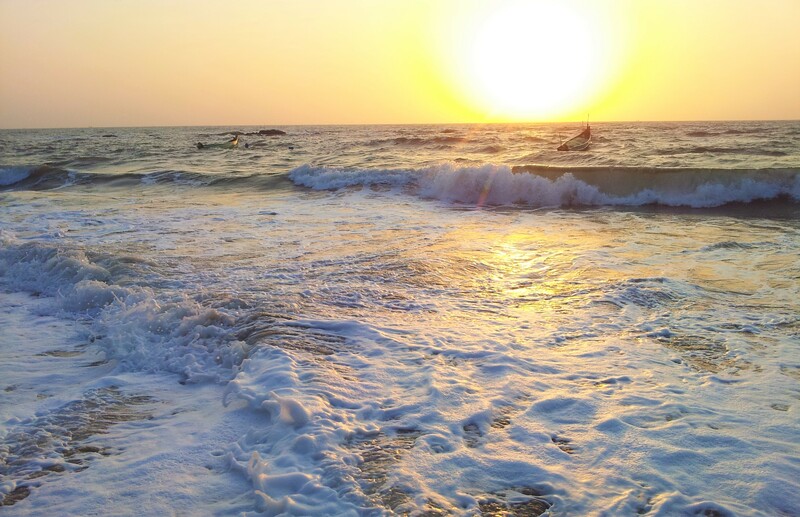 Don’t worry about a few chunks, in Goa, the chunks of coconut are a nice surprise! In a large saucepan, heat the oil and add the onions, cinnamon, salt and curry leaves, saute for 4 minutes. Then add the squash, jackfruit and masala paste, plus the leftover coconut milk from the tin and 150ml water. The green chillies can go in now if you’re using them. Stir and bring to a simmer, cover and cook gently for 40 minutes. Until the squash and jackfruit are nice and tender, adding more hot water to thin out the sauce as needed. Stir in your sweetener and check that you’re happy with the seasoning. Jackfruit is high in fibre, helping us to detox which in turn makes us glow! It also contains a good amount of carbohydrates, keeping us fully charged with energy and is loaded up with vitamin C and some potassium. Jackfruit seeds are a good source of protein and vitamin A.